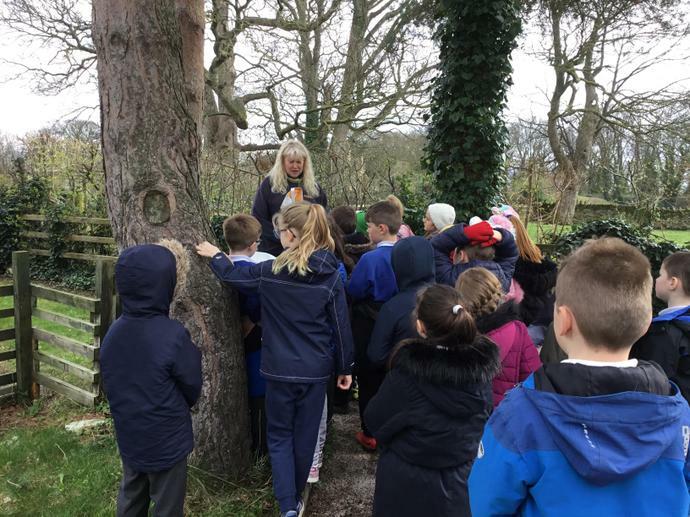 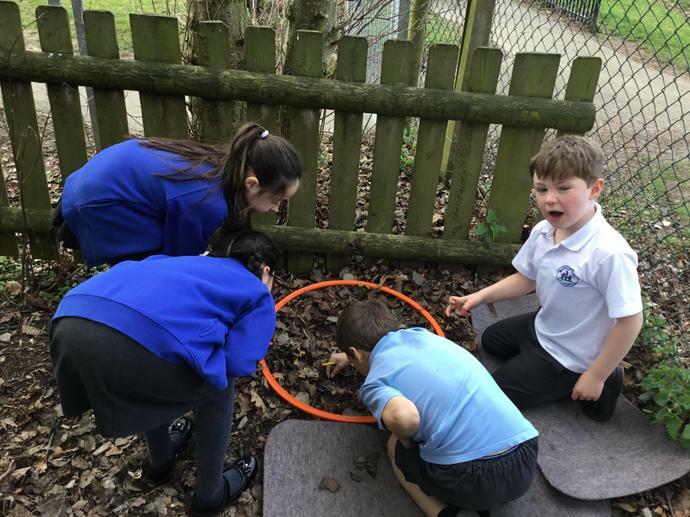 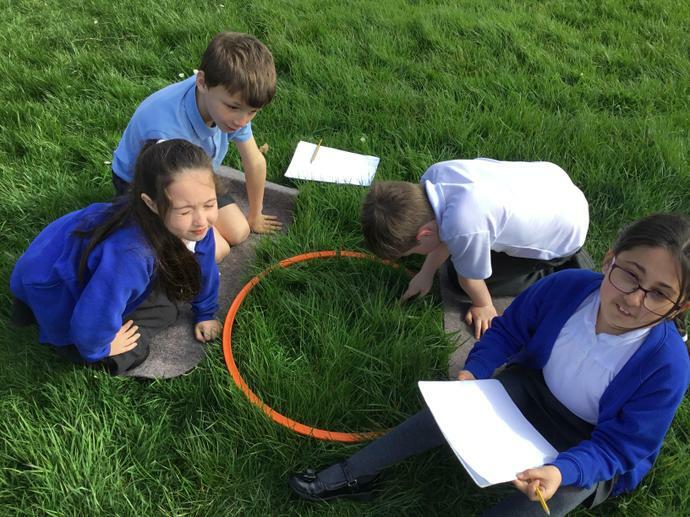 We spent time observing minibeasts in different habitats - field and woodland. 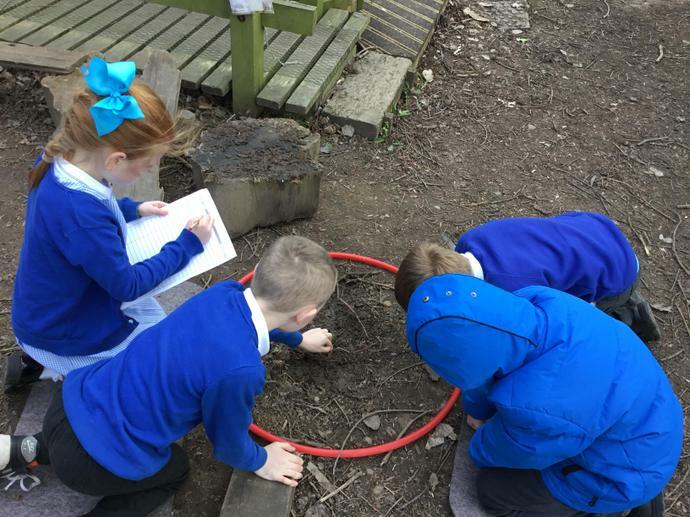 We observed more minibeasts, and a greater variety, in the woodland habitat. 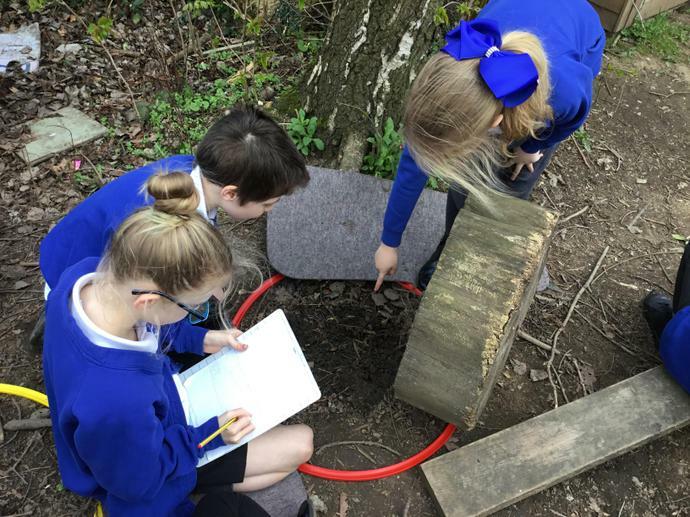 When we got back to class we discussed why minibeasts might prefer this habitat, collated our data and used it to make a bar graph. 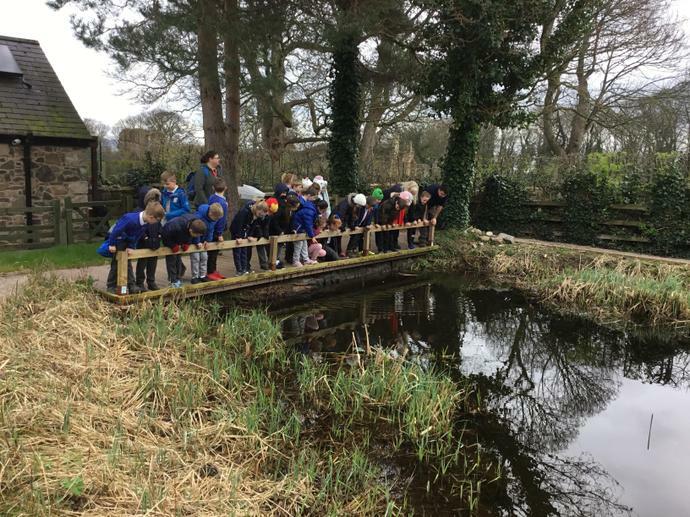 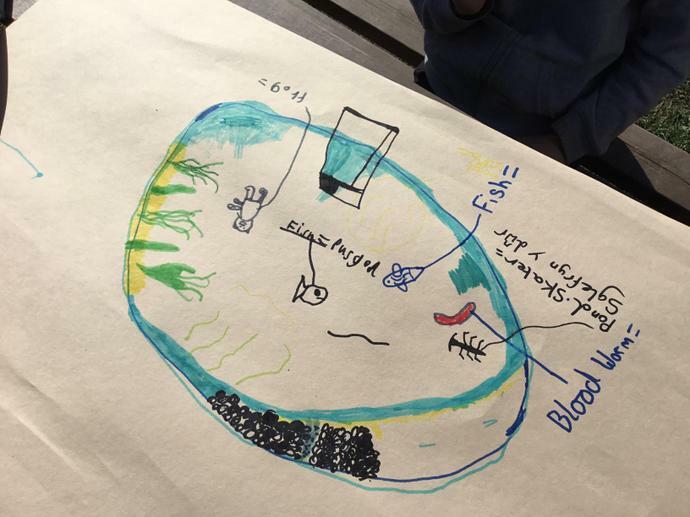 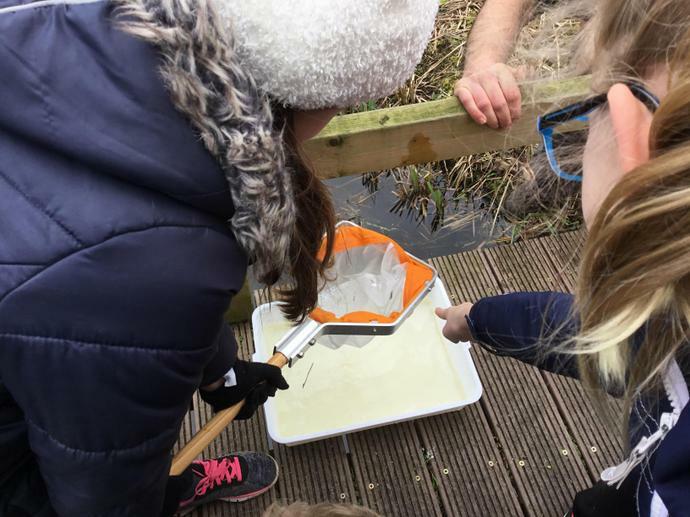 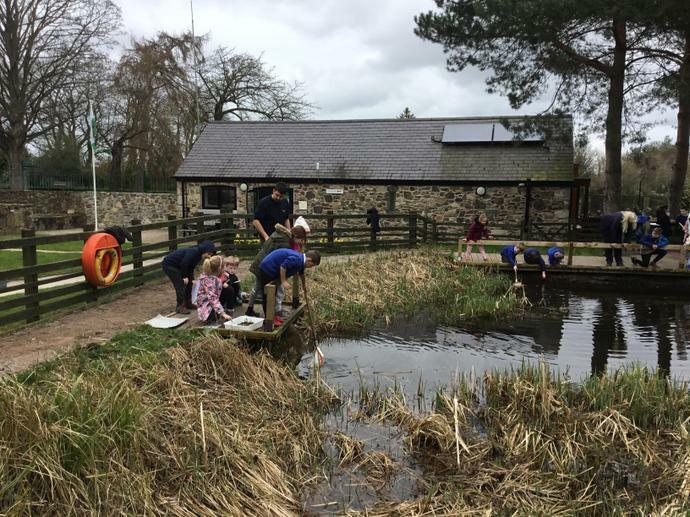 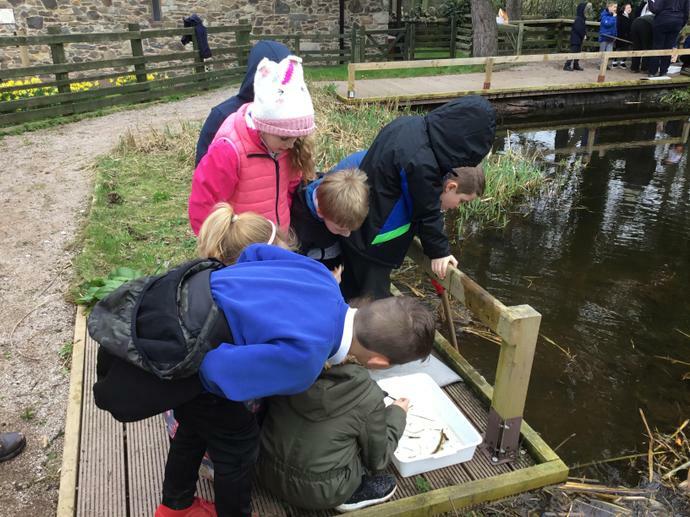 We had a great time exploring pond habitats through our pond dipping activity and found lots of different creatures. 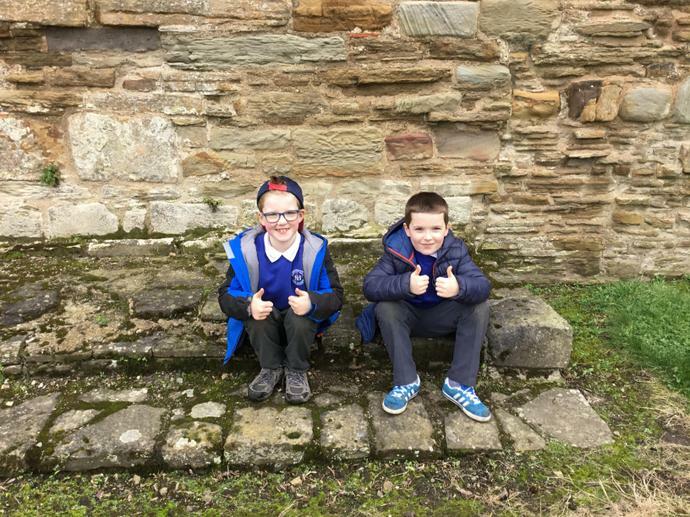 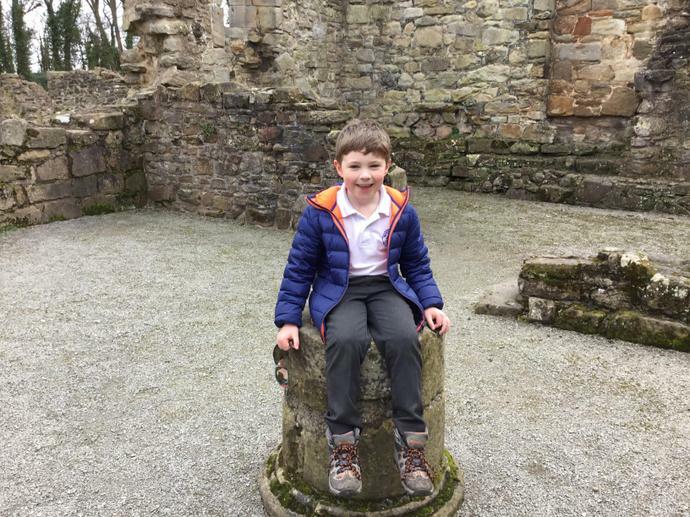 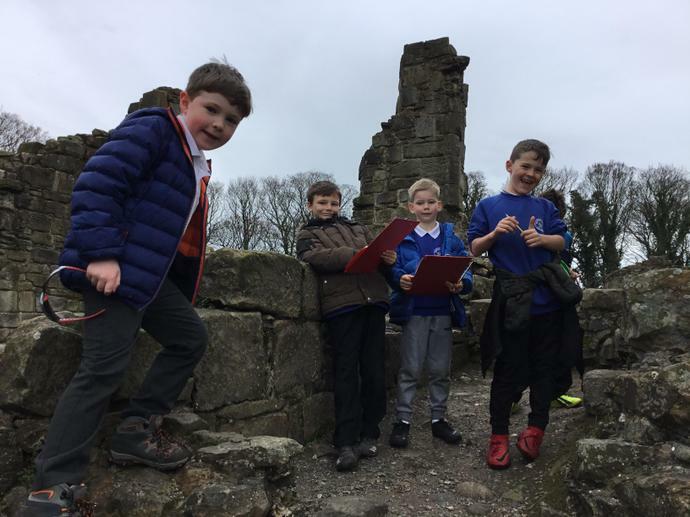 We also learned about the history of Basingwerk Abbey by exploring the ruins and finding a variety of architectural features using our map skills and by close observation. 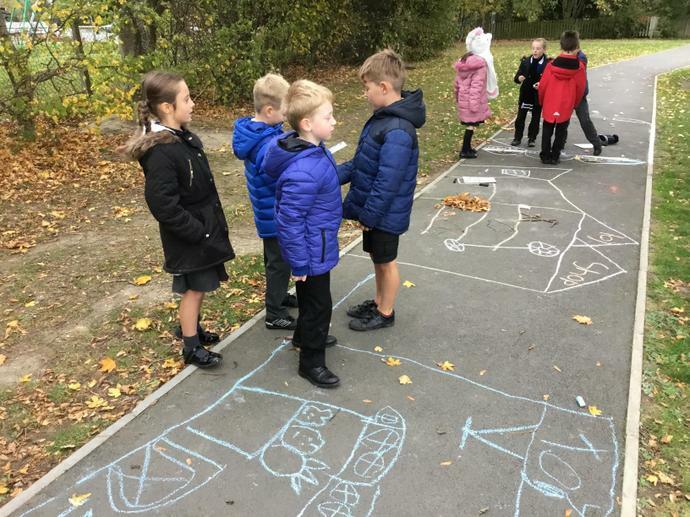 We had time to play in the outdoor playground too! 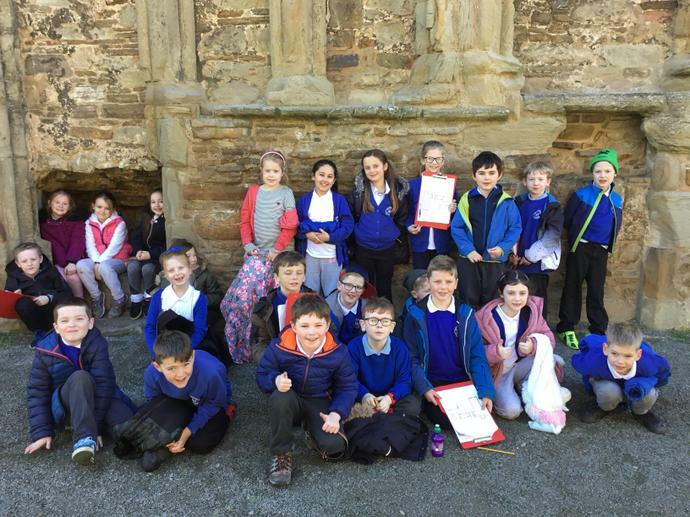 What a fun and busy day! 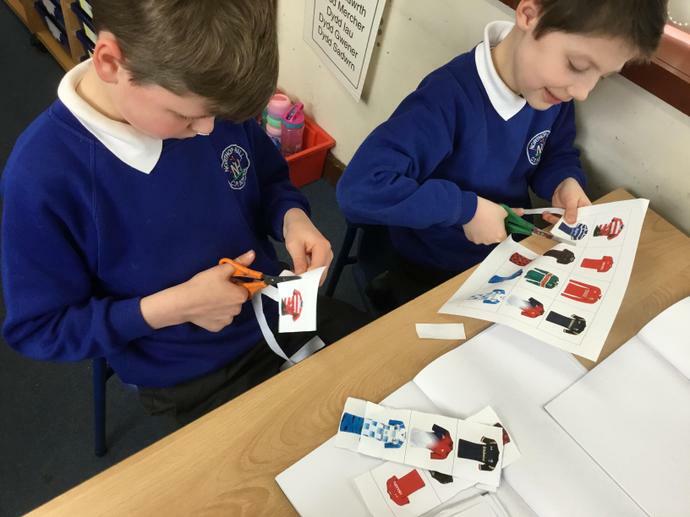 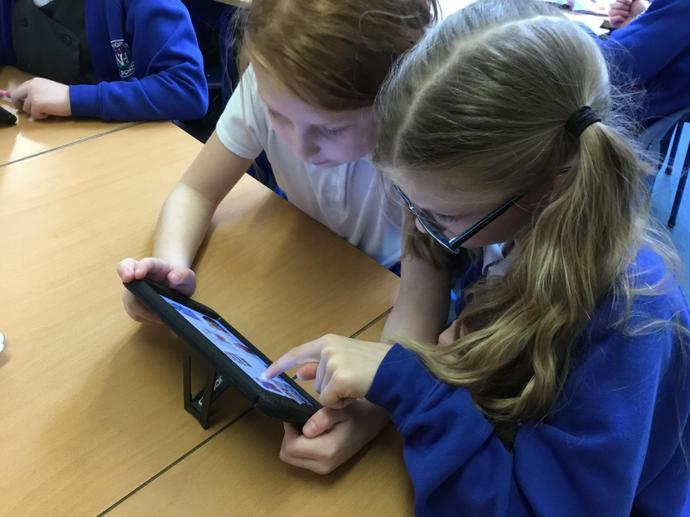 We have started our design and technology project today - we’re going to be designing rugby shirts. 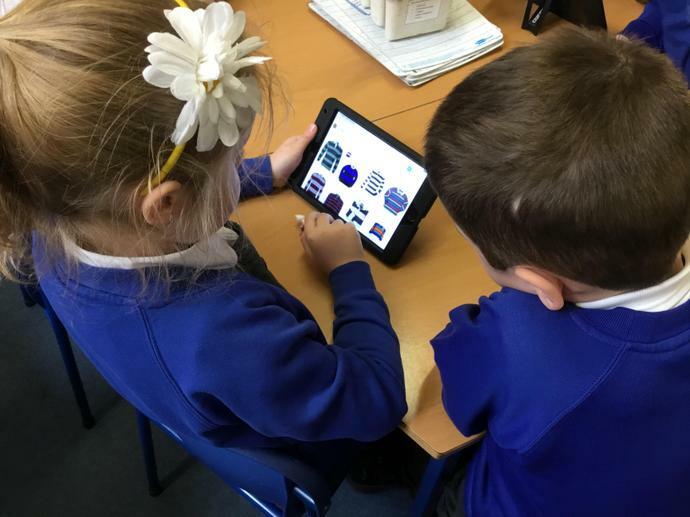 Our first step is to research rugby shirts to come up with a design specification. 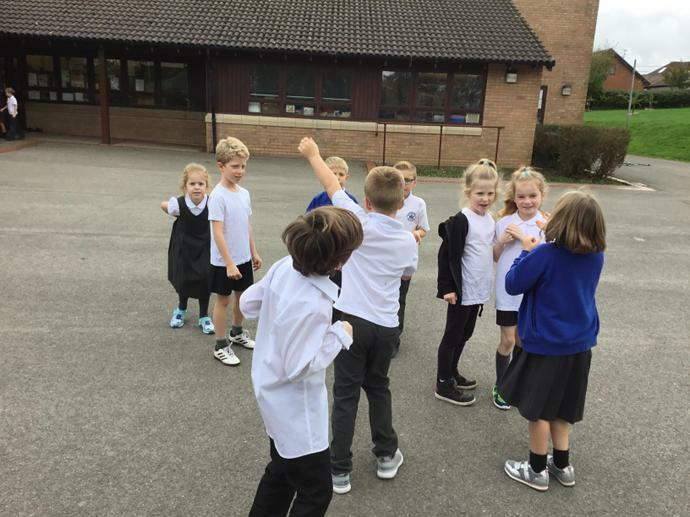 We are also diamond or pyramid ranking rugby shirts to start thinking about what we like personally in a design. 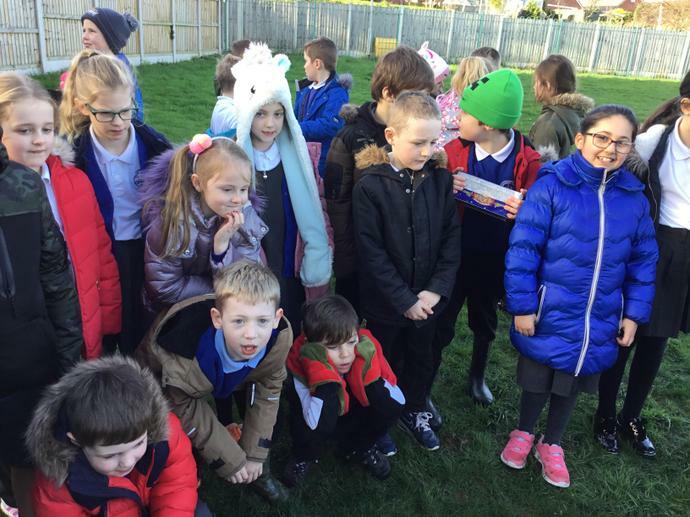 Creative costumes for World Book Day! 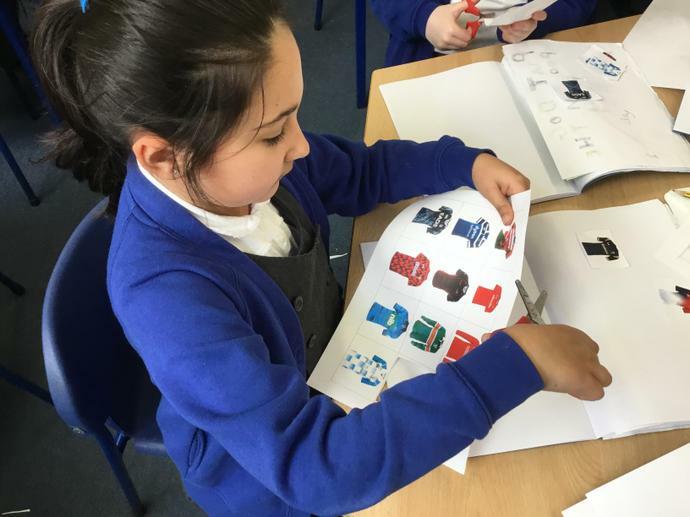 We’re putting our Learning Log work to good use this week in a project with Year 4. 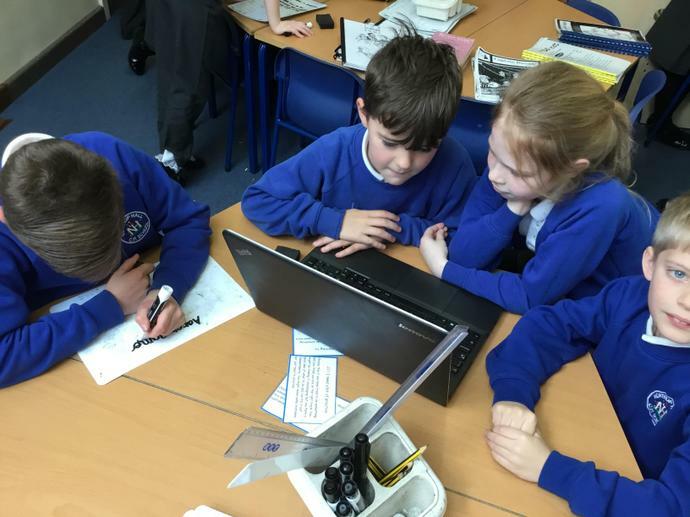 We’re making a Power point presentation about famous Welsh people which parents will be invited to see themselves! 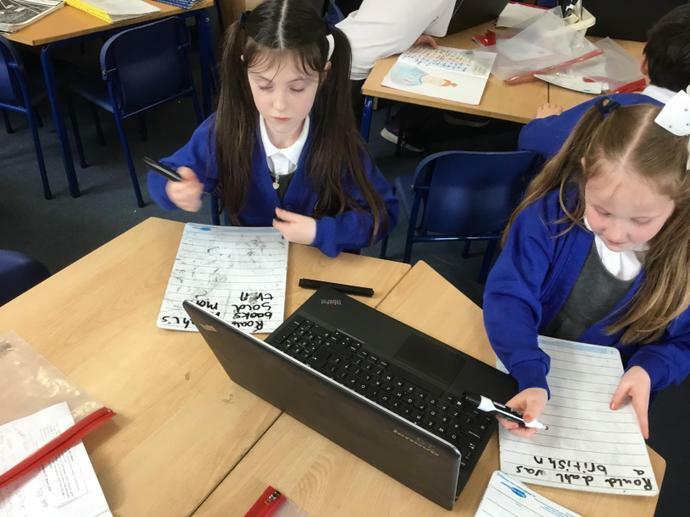 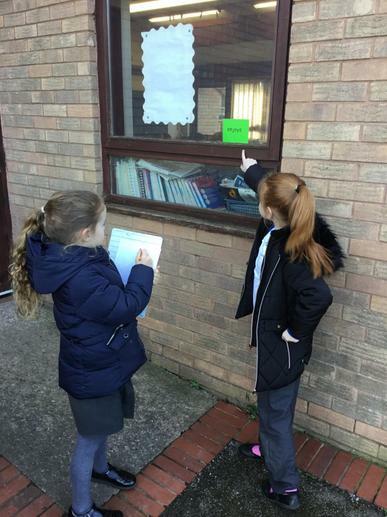 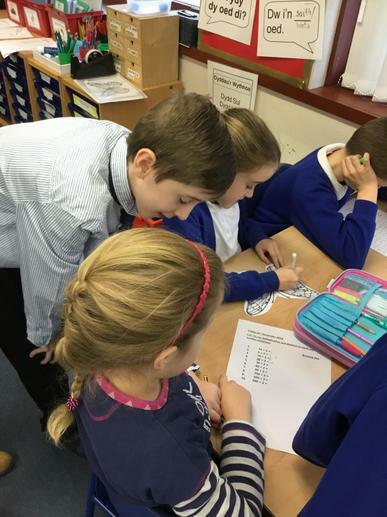 Year 3 have been on a verb hunt! 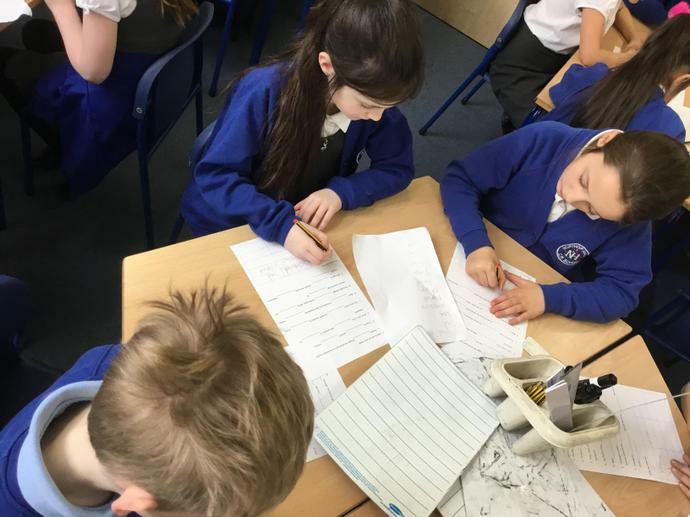 They found 15 different verbs to use to complete sentences and then had to sort them into past tense verbs or present tense verbs. 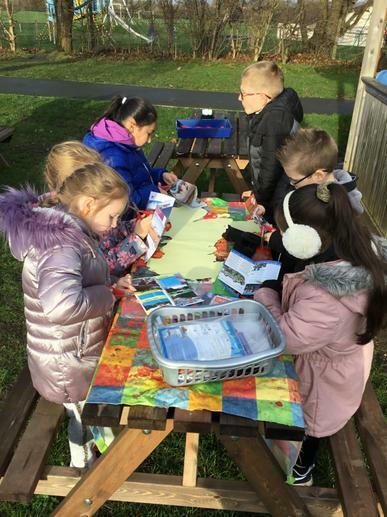 Today, we’ve had a Welsh focus in our activities: we’ve practised the national anthem, played “mae Simon yn dweud and made a Welsh art attack style picture using fabric. 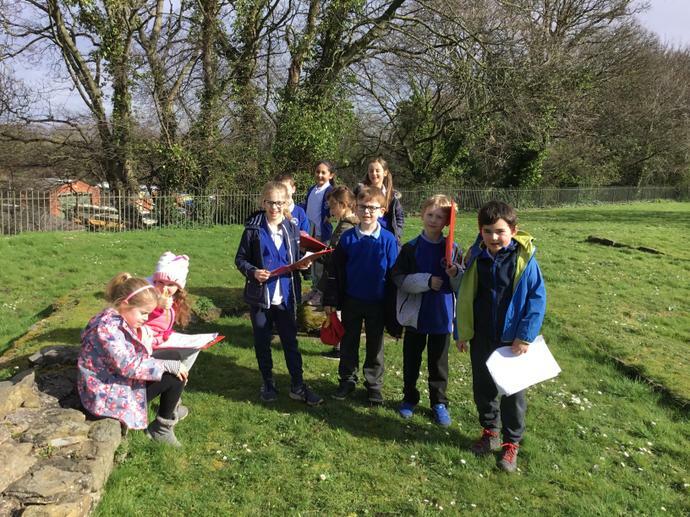 Roedden hwyl iawn! 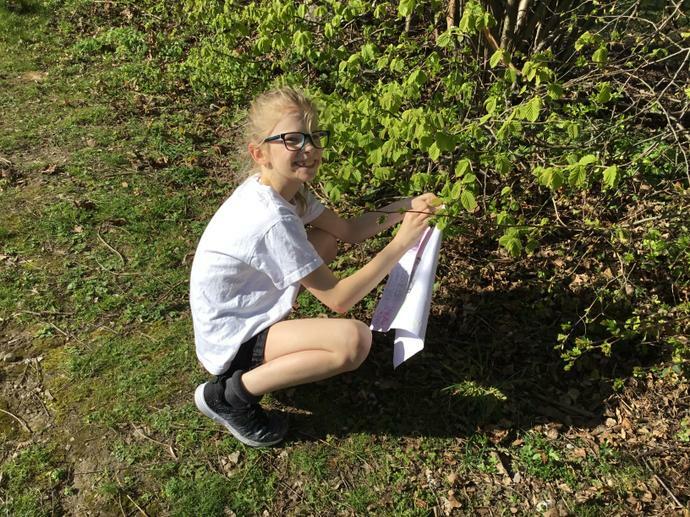 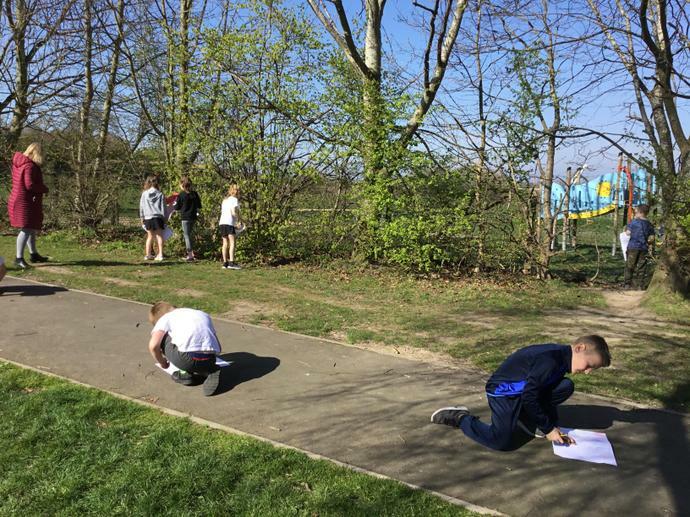 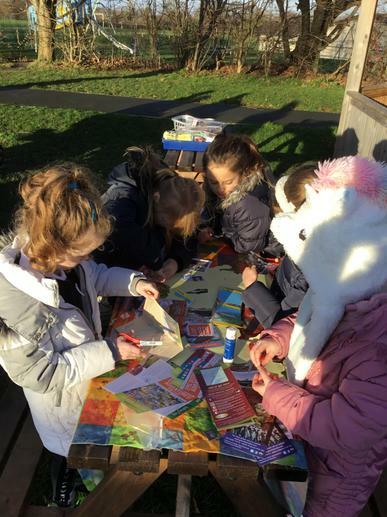 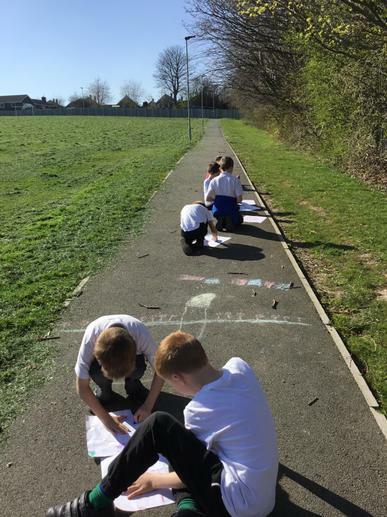 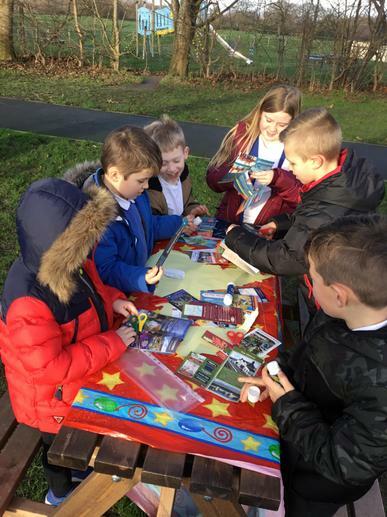 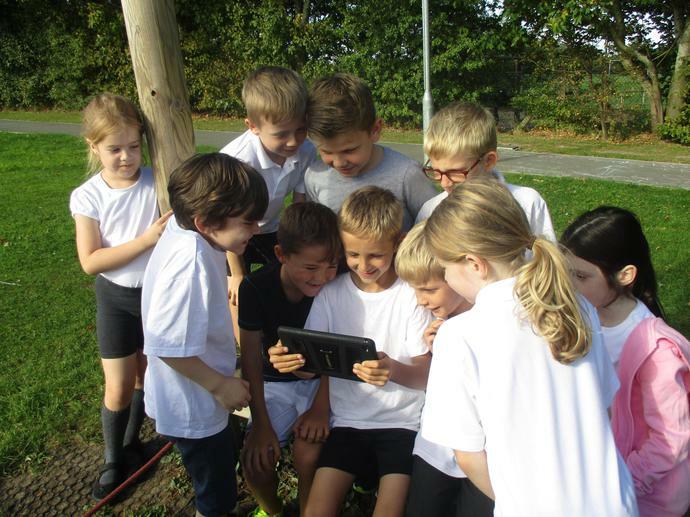 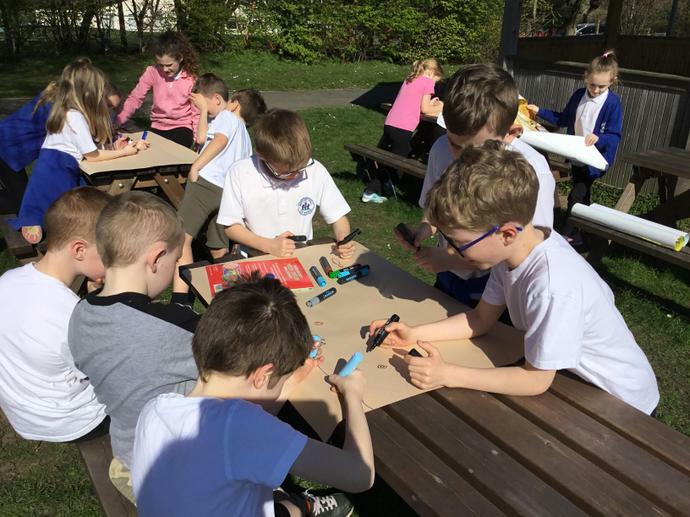 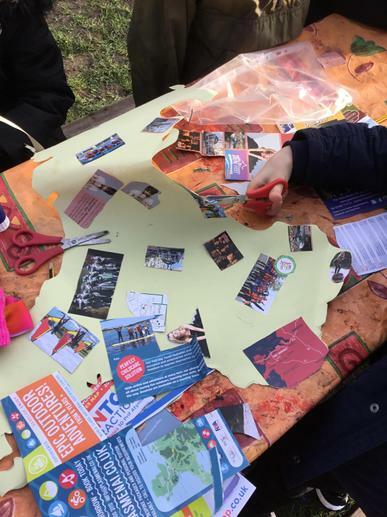 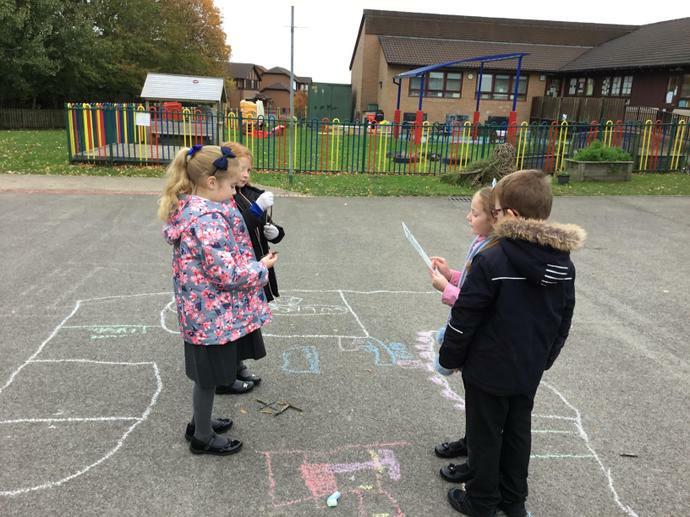 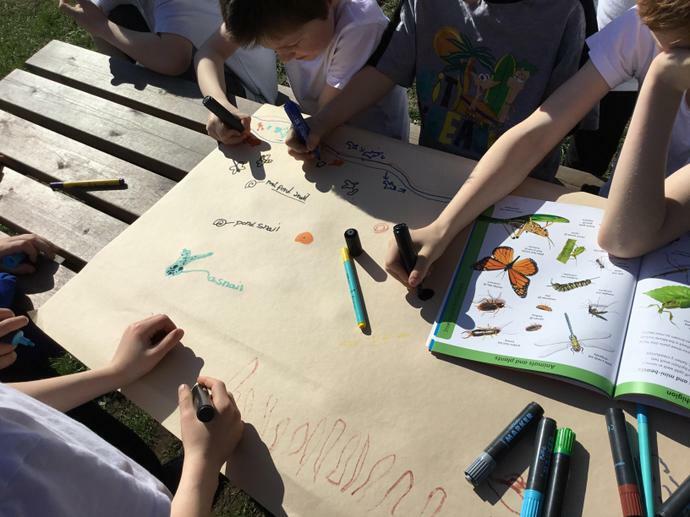 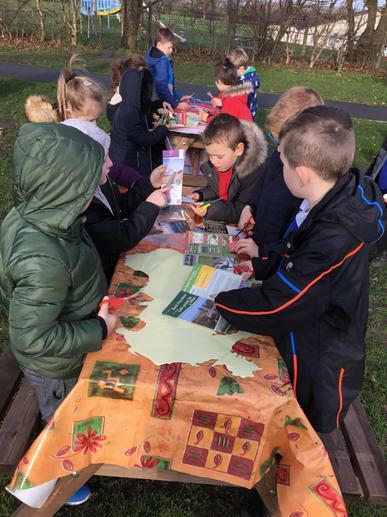 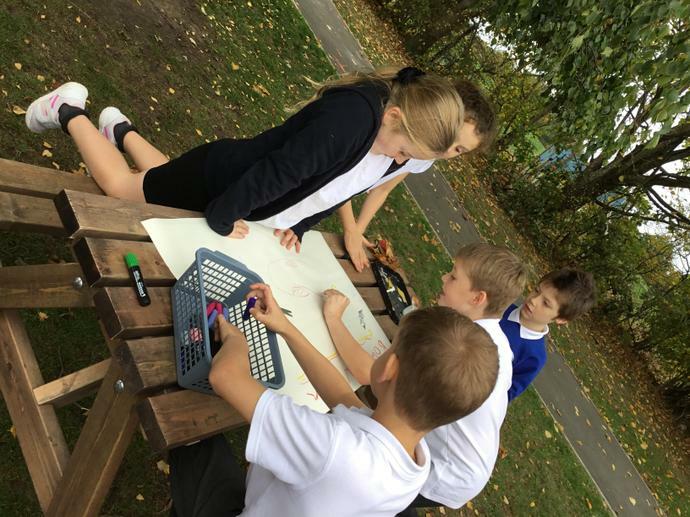 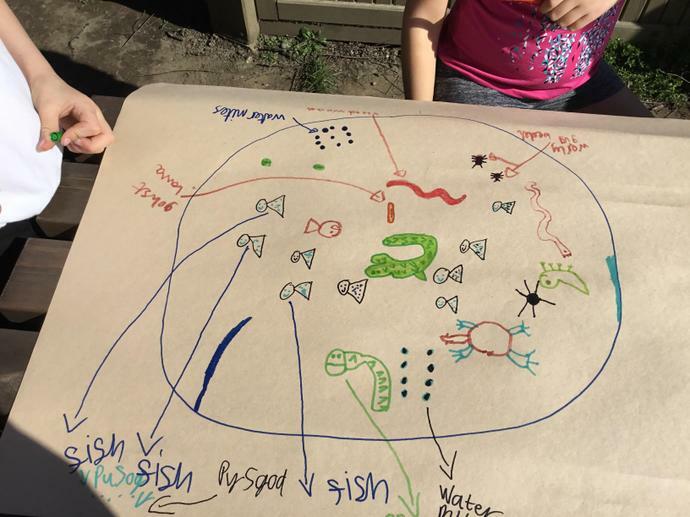 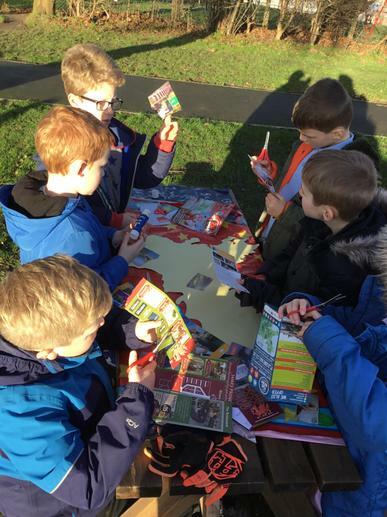 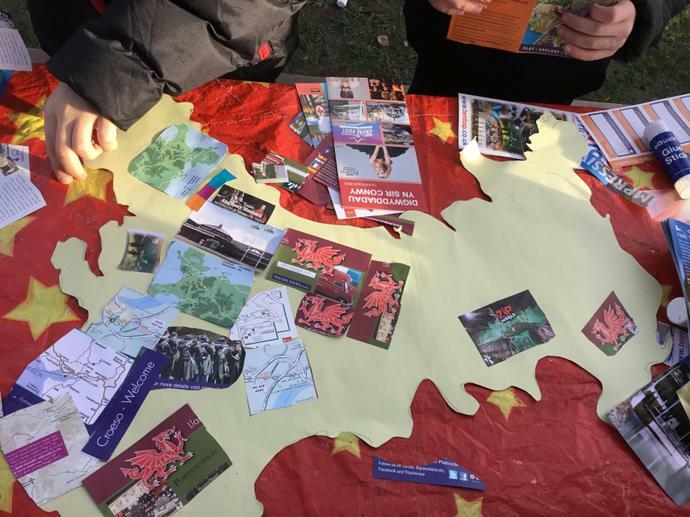 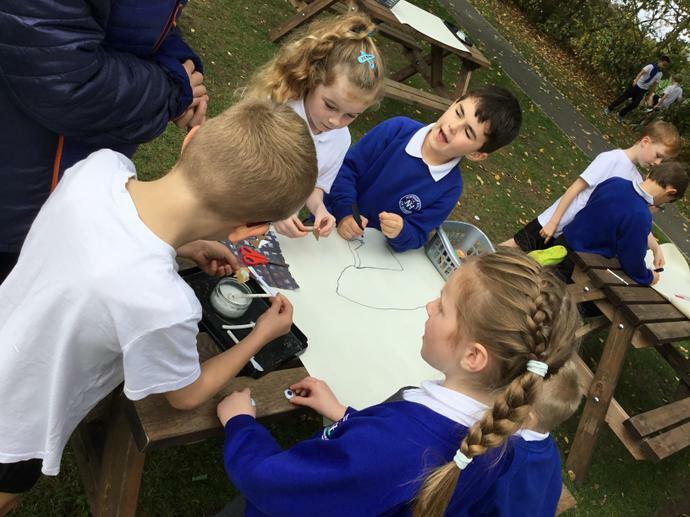 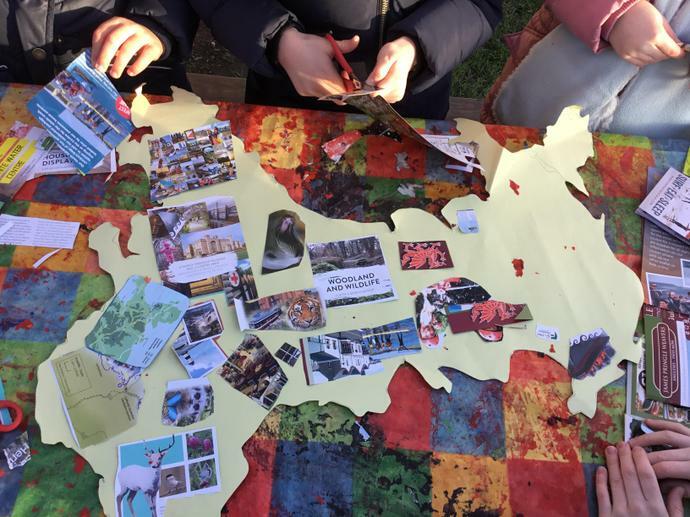 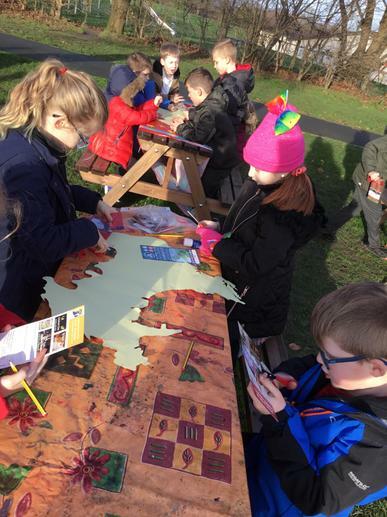 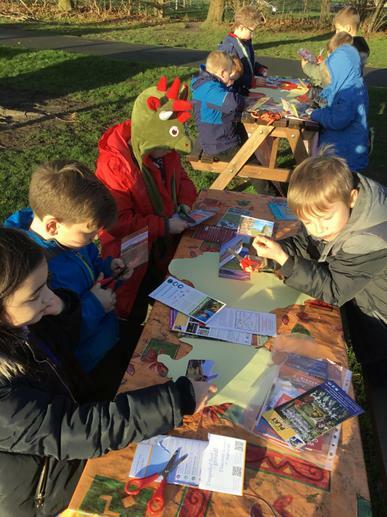 Outdoor Learning art activity - Welsh map collage with Welsh pictures. 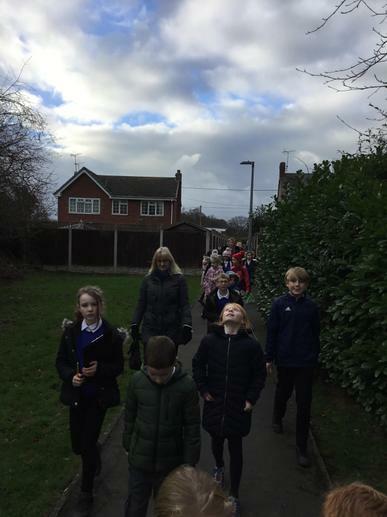 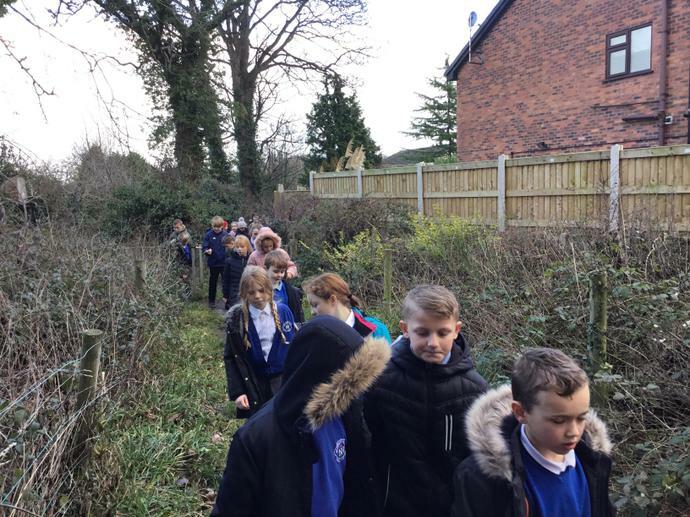 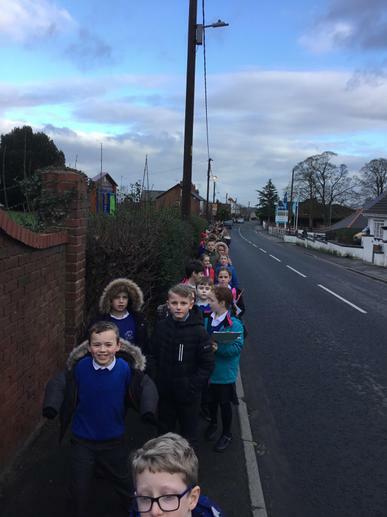 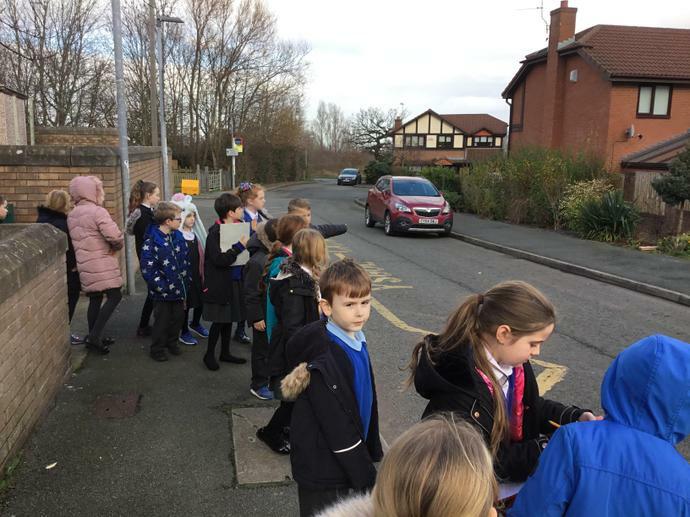 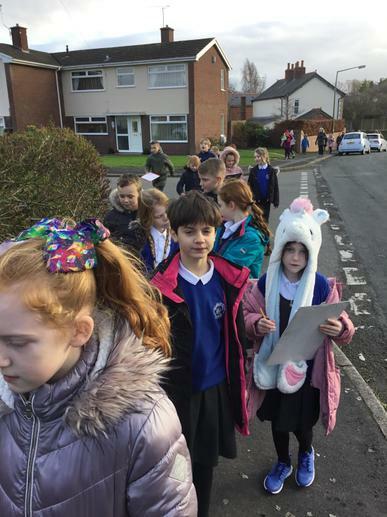 Today, all of Key Stage 2 went for a walk around the village to get to know our local area. 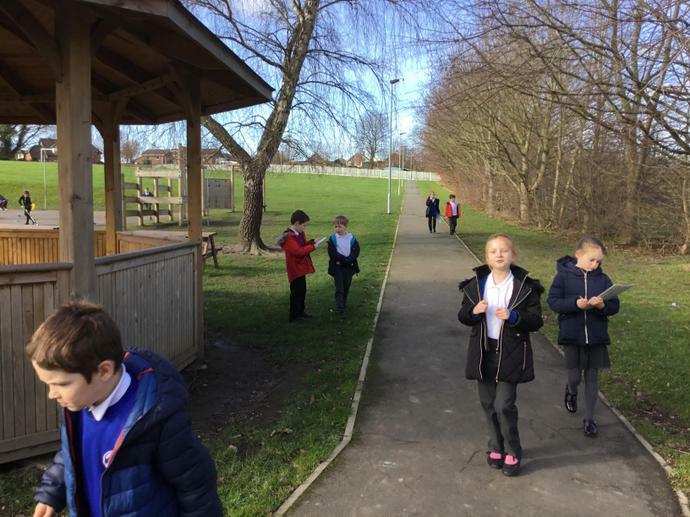 The children were in groups and had to look for different buildings and other human geography. 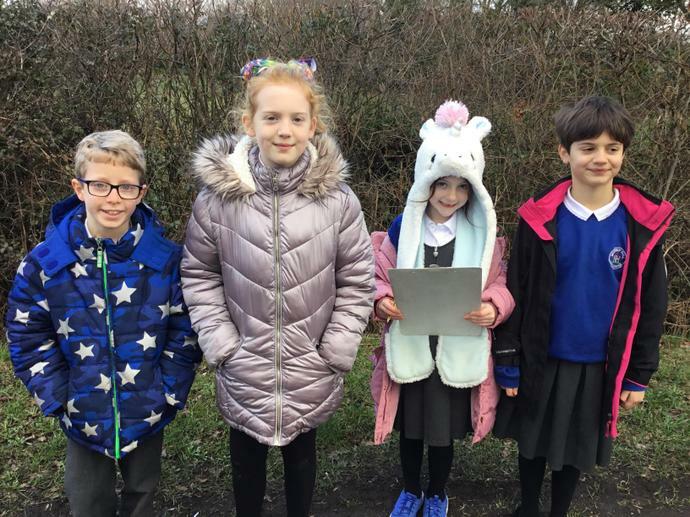 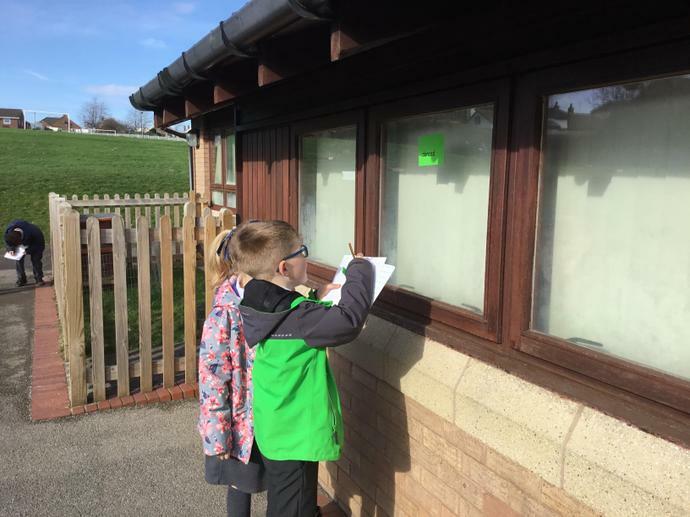 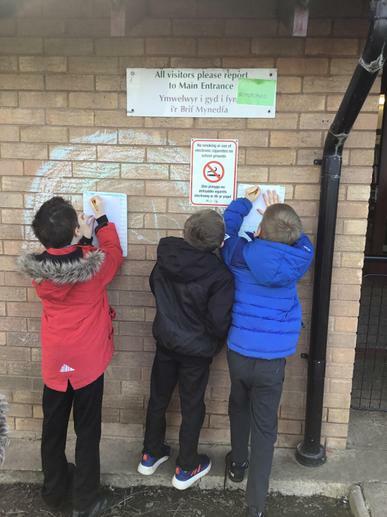 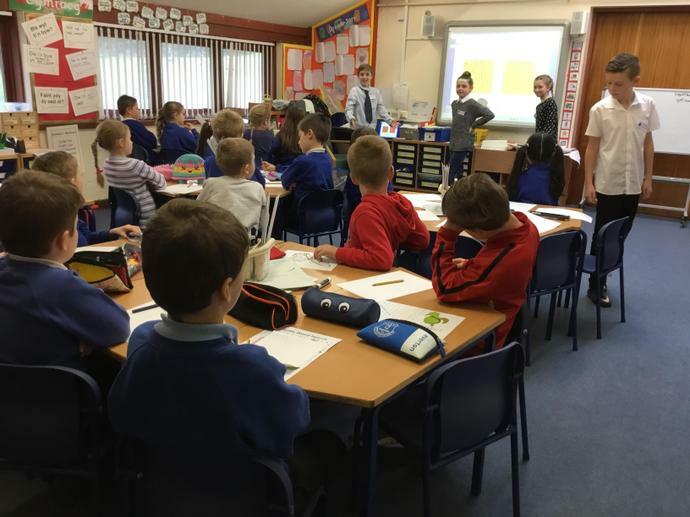 They also conducted a litter and bin survey. 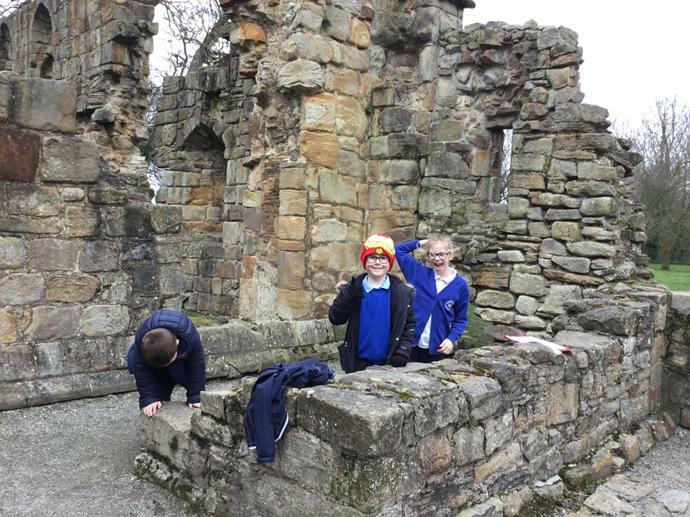 Lots of children went to places they had never been before, even those children who live in the village! 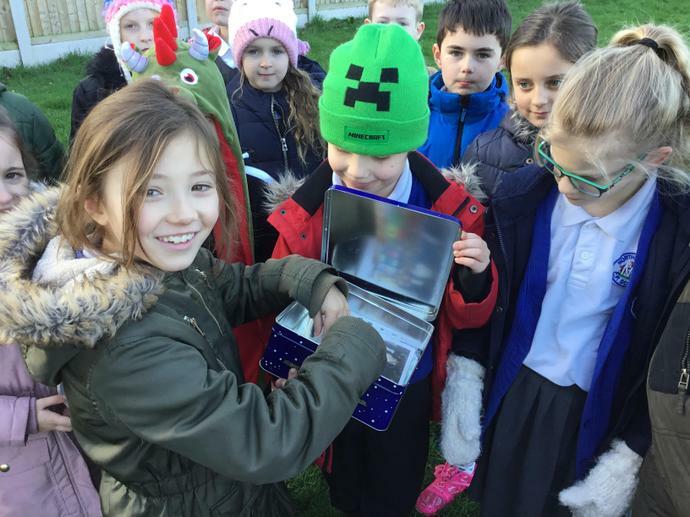 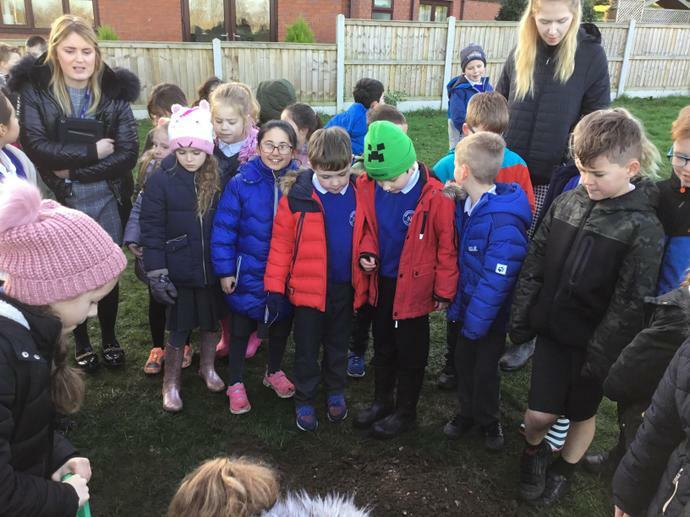 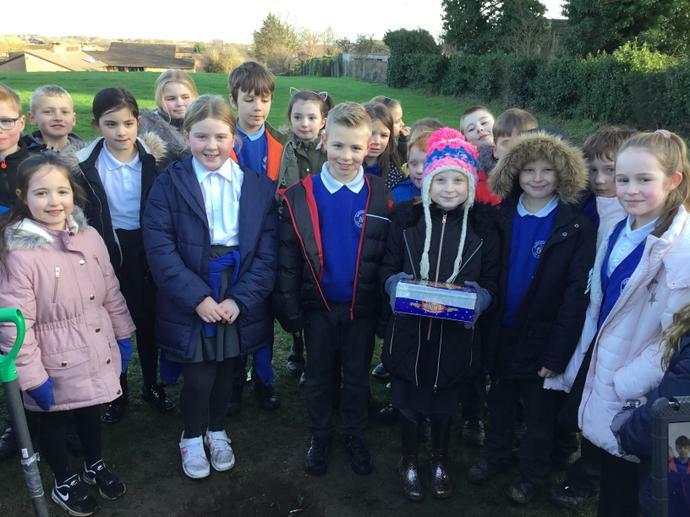 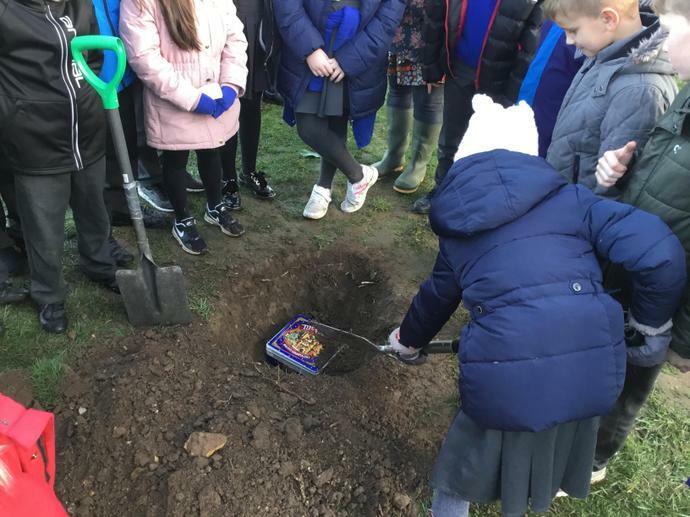 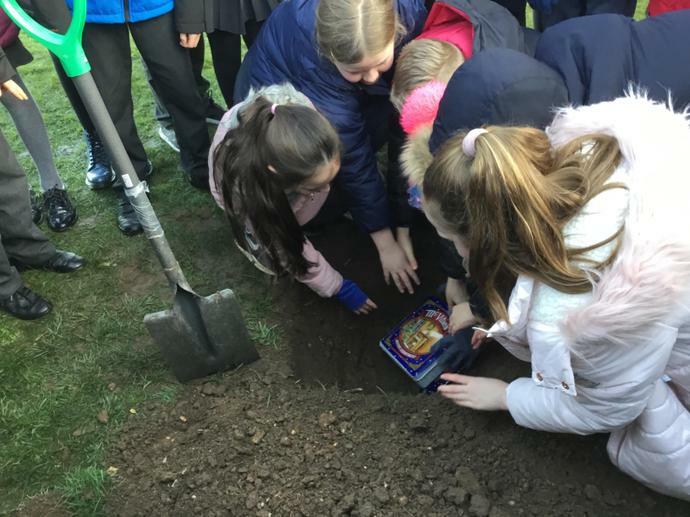 To finish off our War and Peace topic, Years 3, 4 and 5 have written letters to bury in a time capsule for future pupils of Northop Hall to discover, just like the one we found back in September. 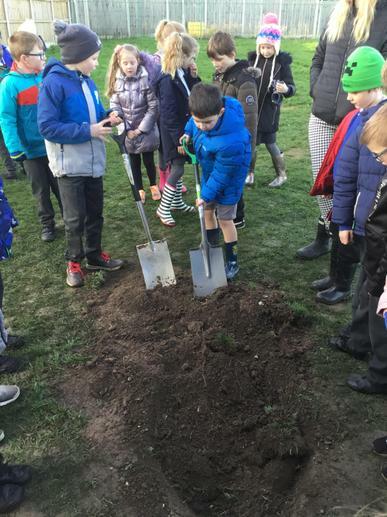 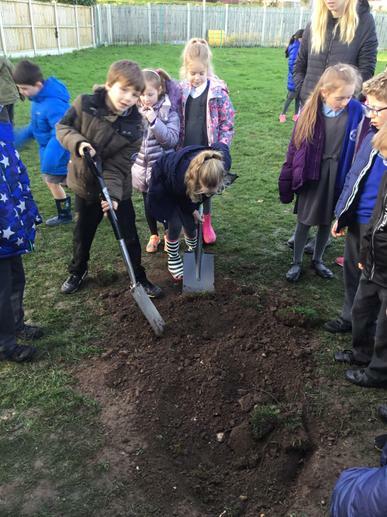 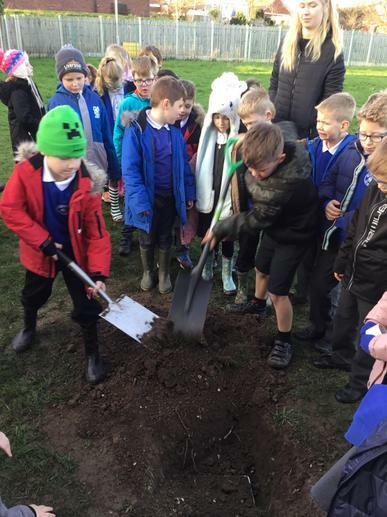 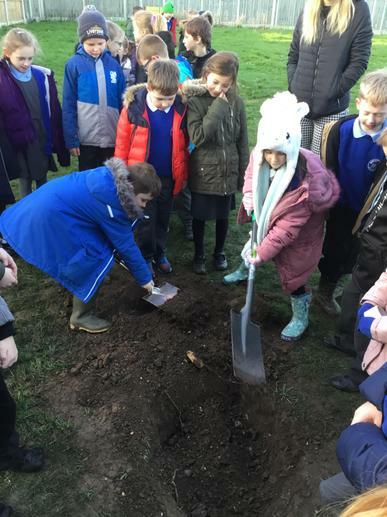 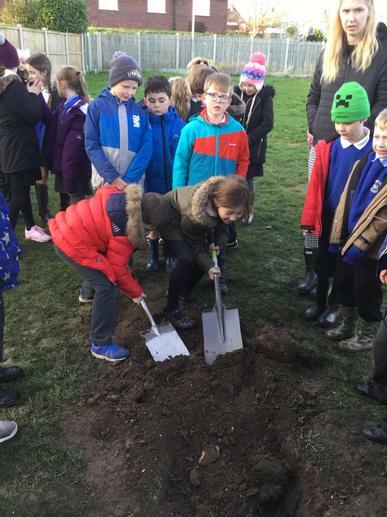 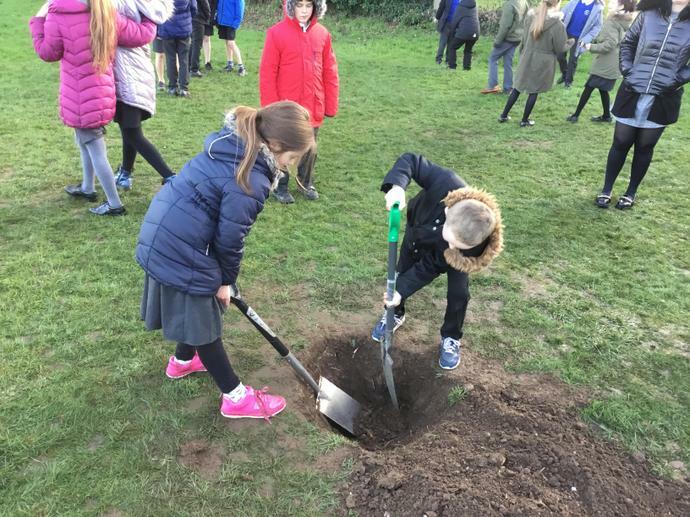 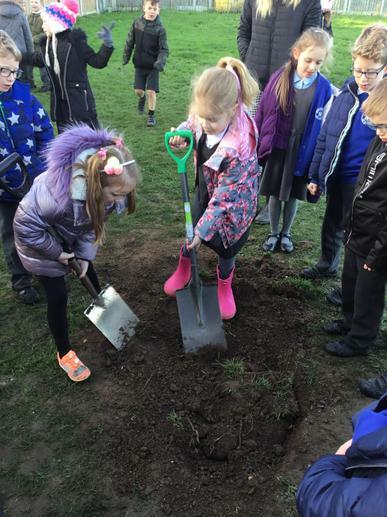 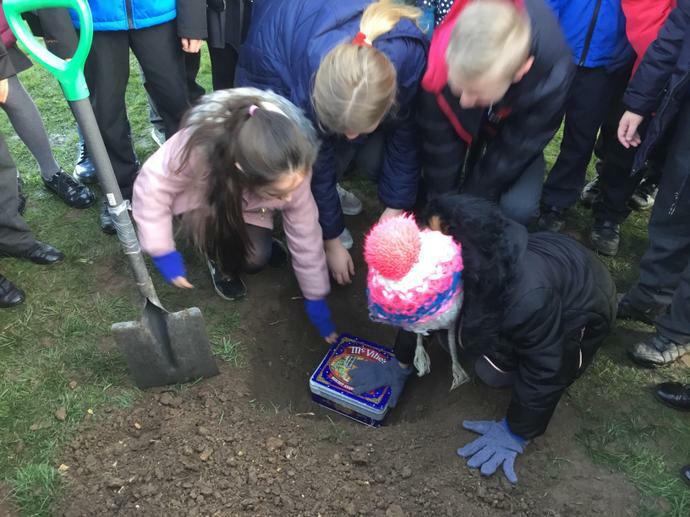 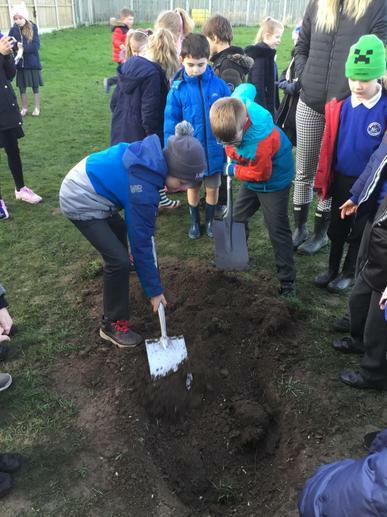 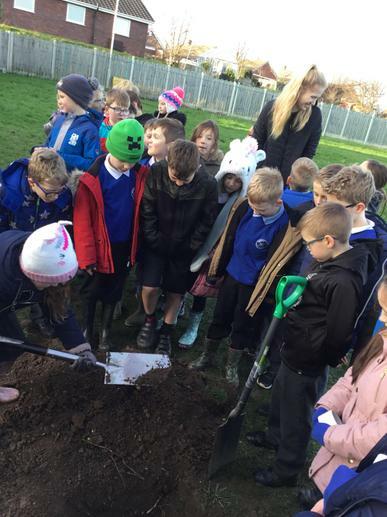 All the children took turns to either dig the hole or cover up the time capsule. 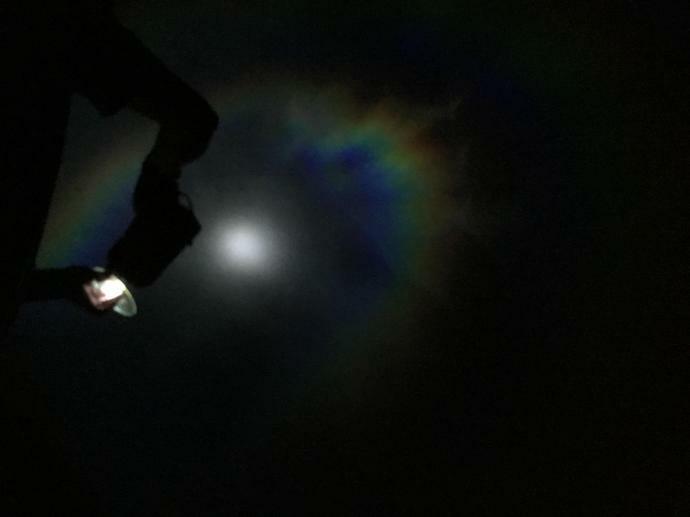 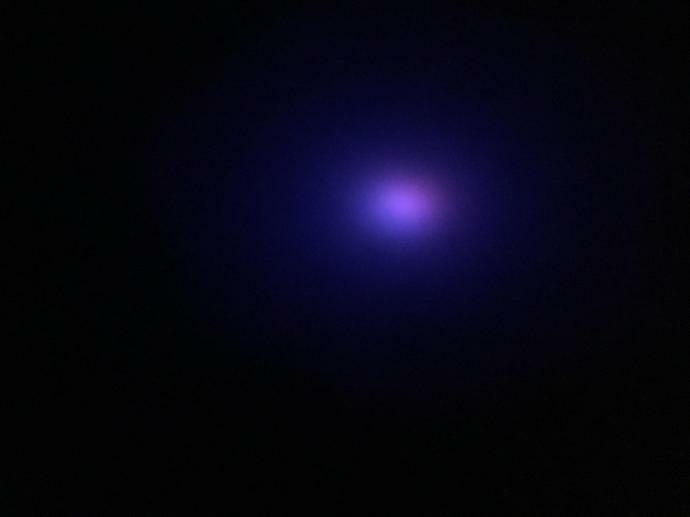 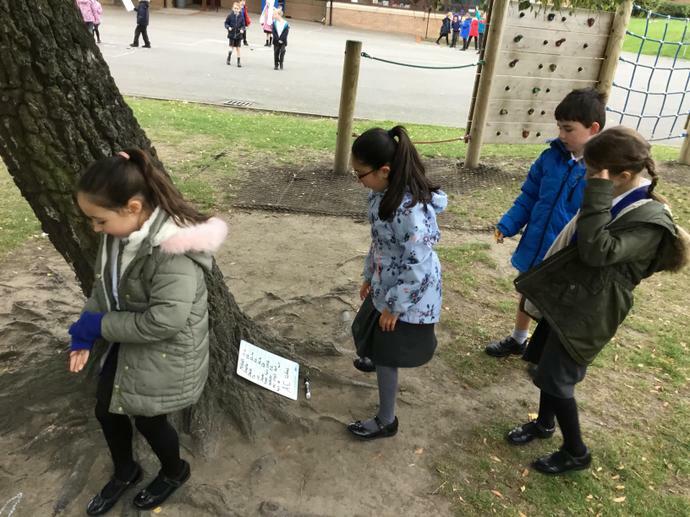 I wonder when it will be found! 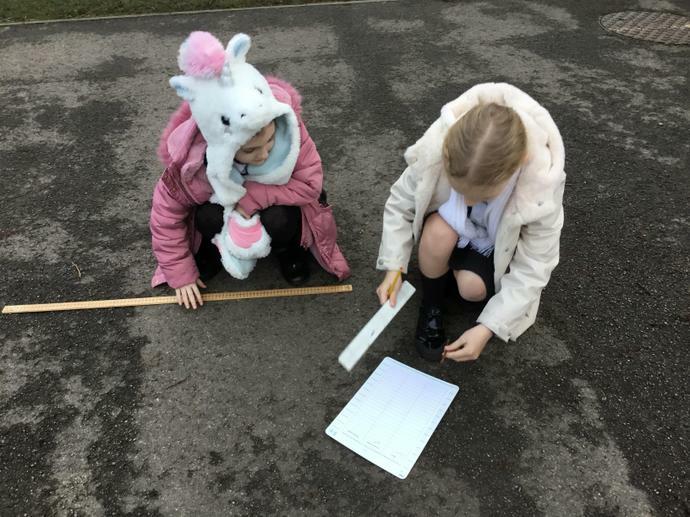 Today we’ve been practising estimating and measuring skills. 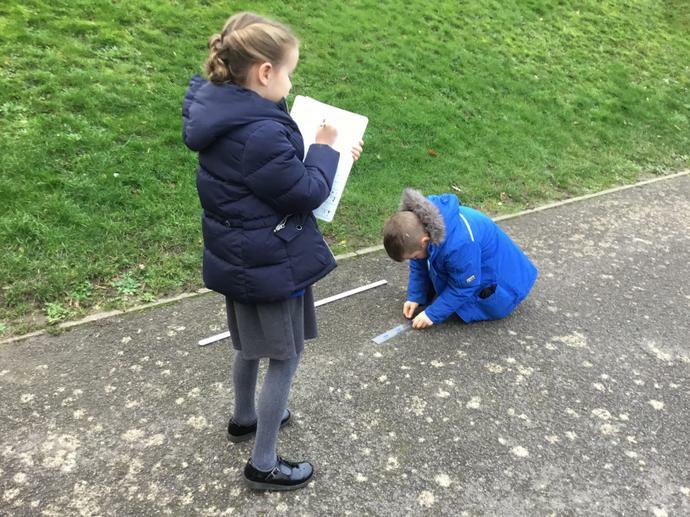 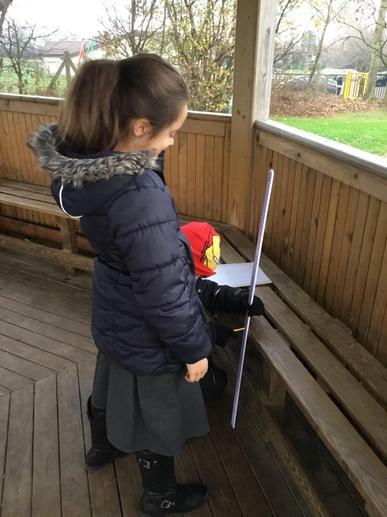 The children have had to choose suitable measuring equipment too. 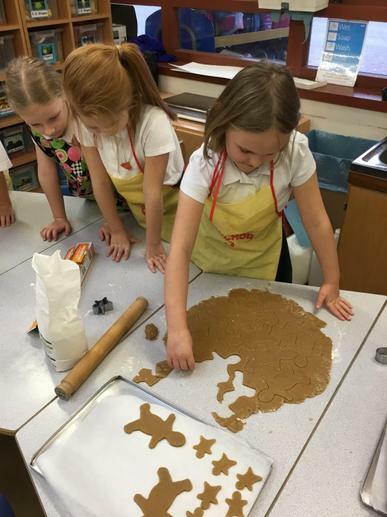 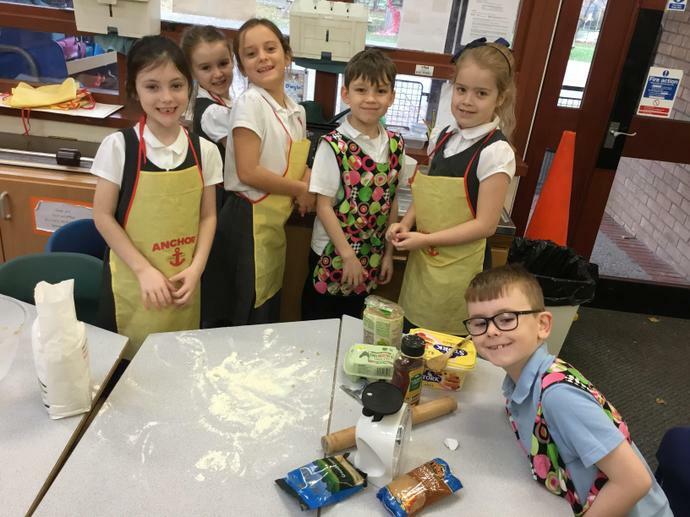 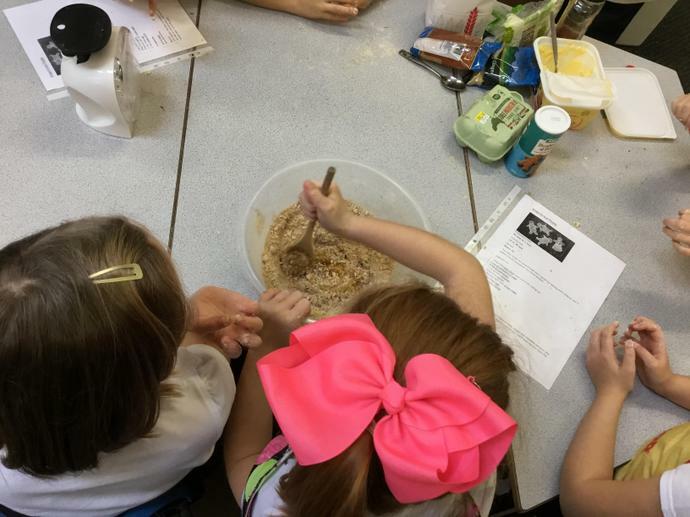 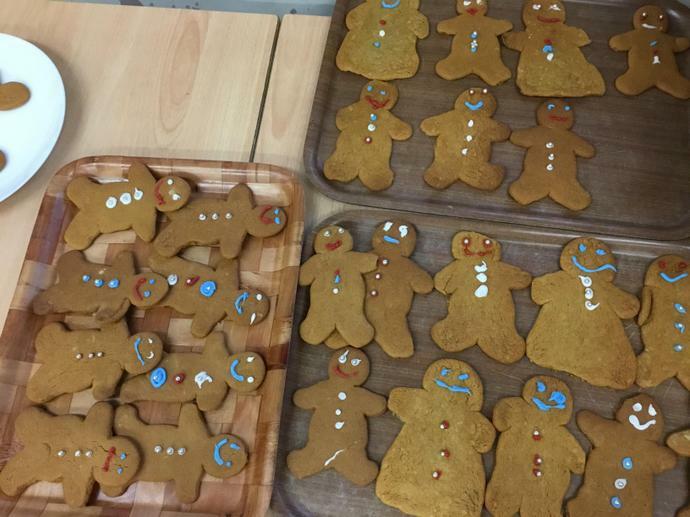 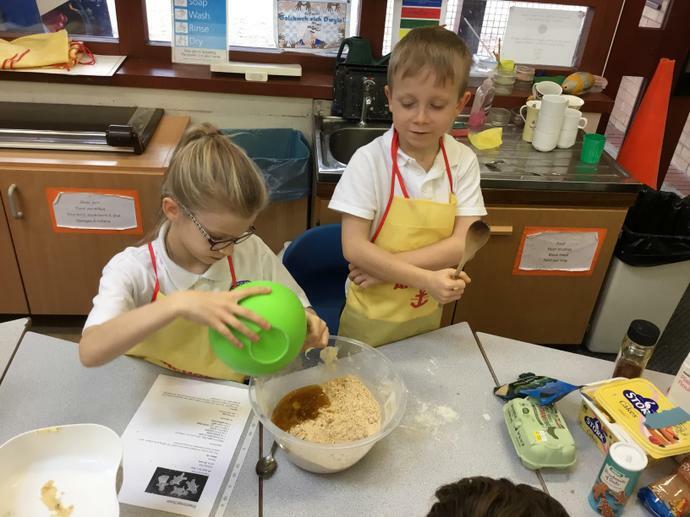 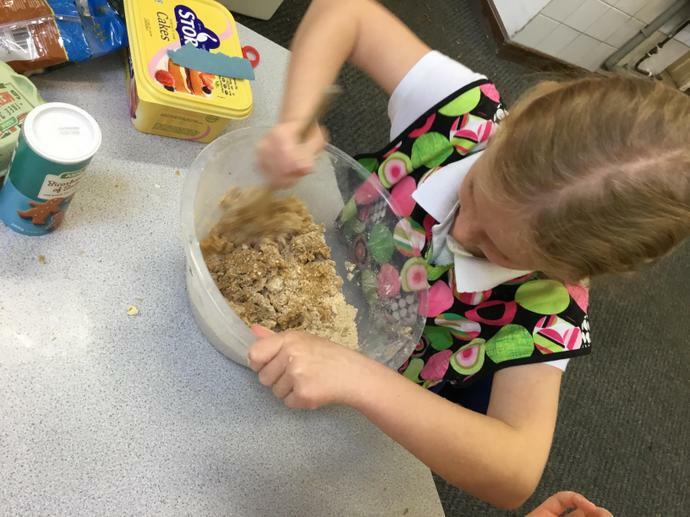 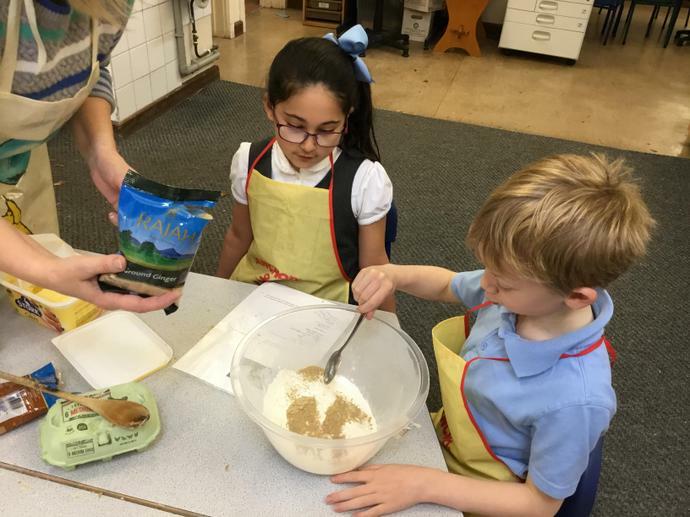 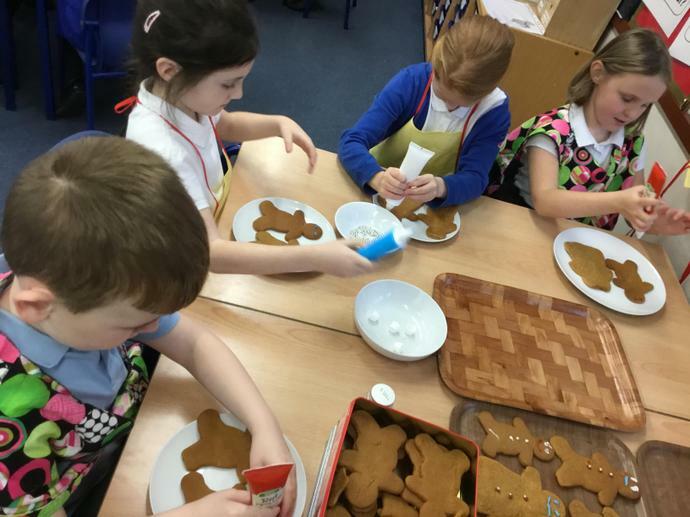 We have started to make gingerbread this week to sell at the Christmas Fayre! 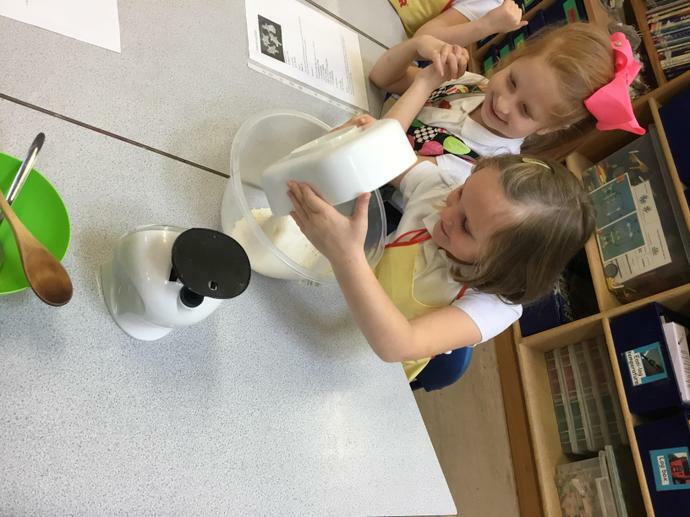 All of the children are involved and are learning about following instructions, measuring and the importance of hygiene! 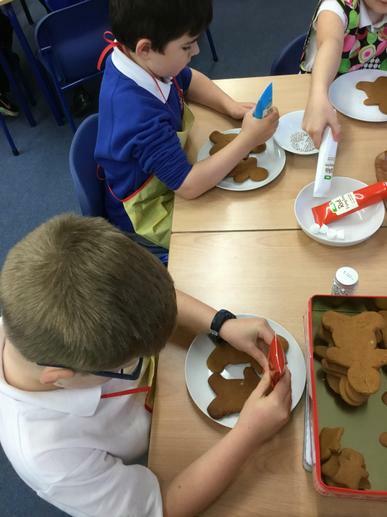 We will be cutting out the shapes and baking this afternoon. 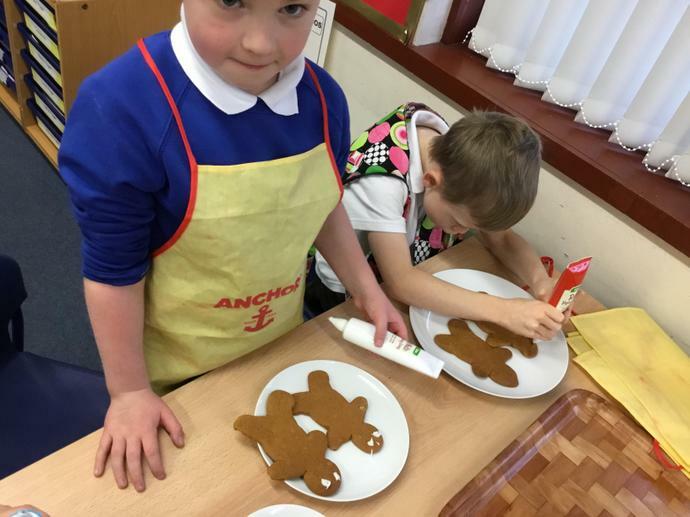 The gingerbread should be ready to decorate on Tuesday and Wednesday before finishing touches on Thursday morning. 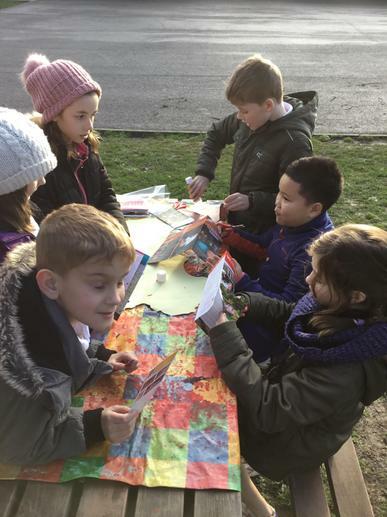 Please come and support the Year 3 stall. 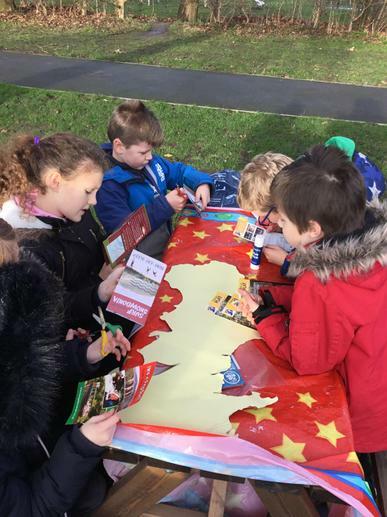 National Takeover Day! 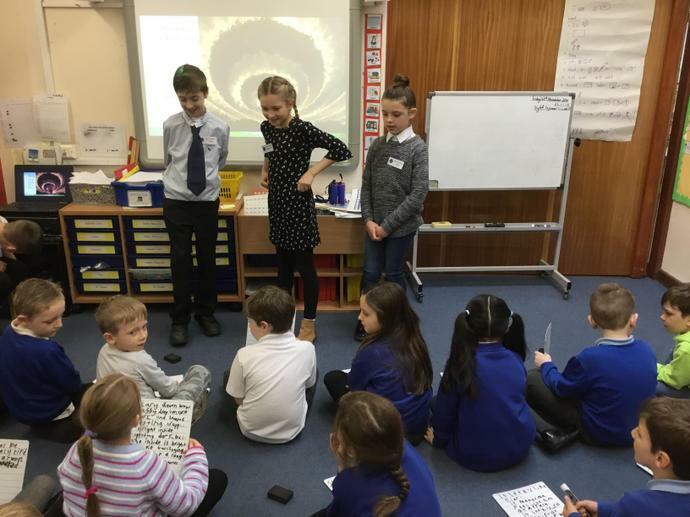 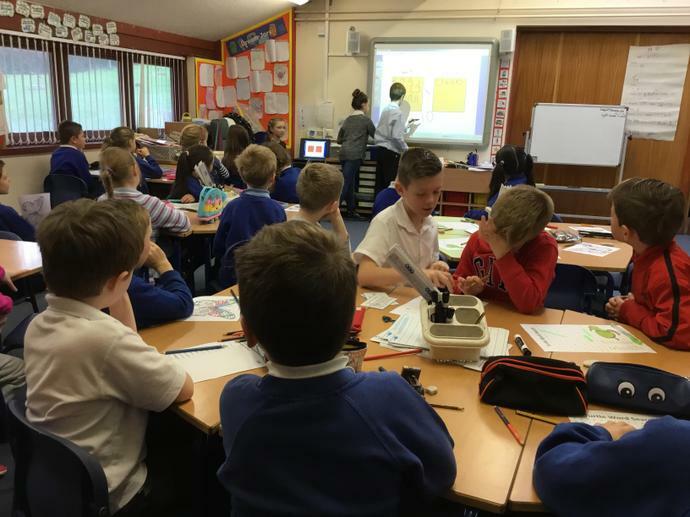 Year 3 are enjoying having their new teachers and teaching assistants! 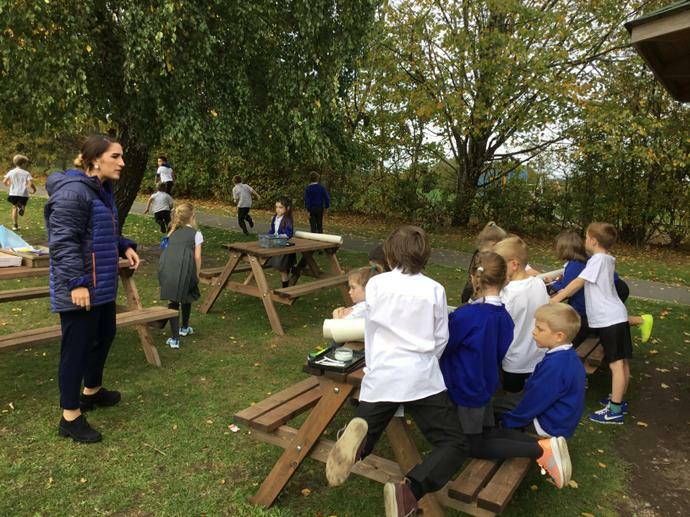 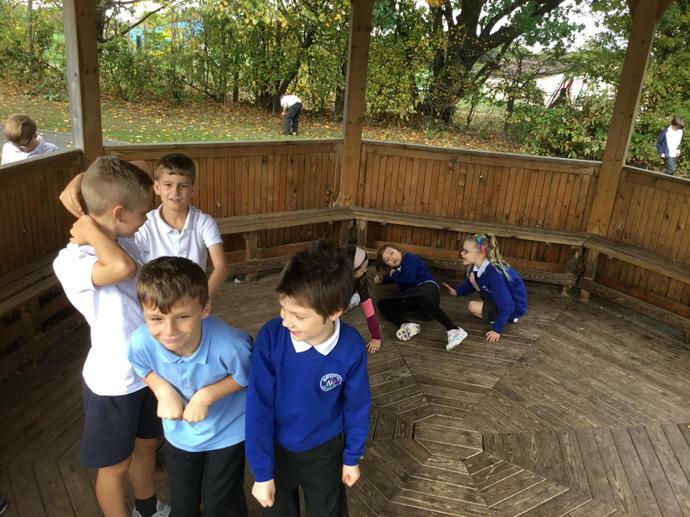 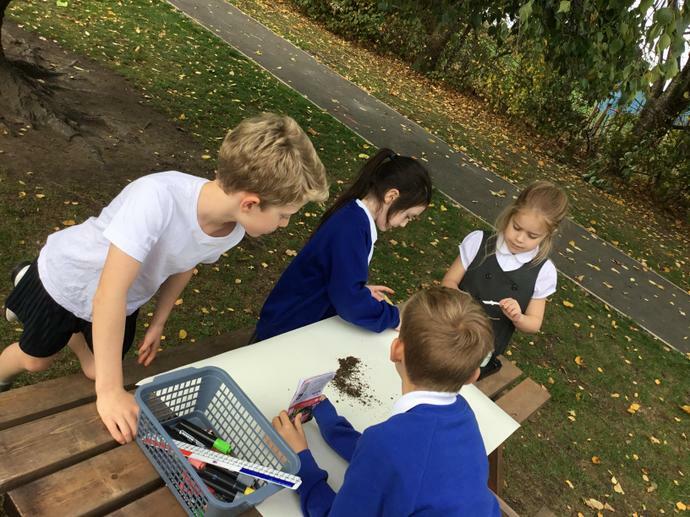 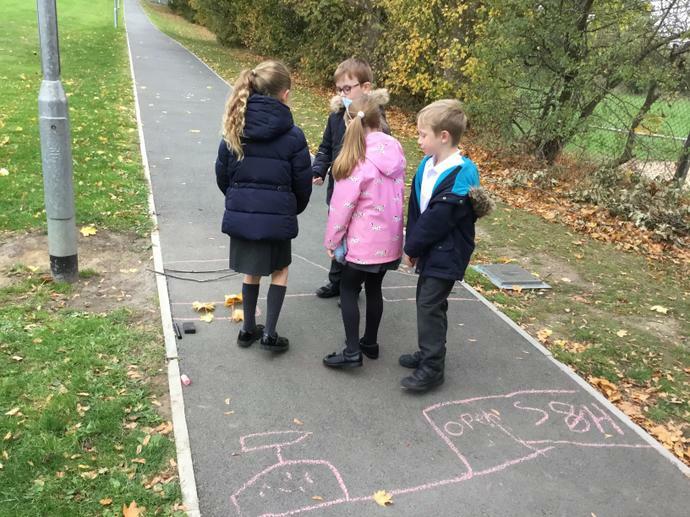 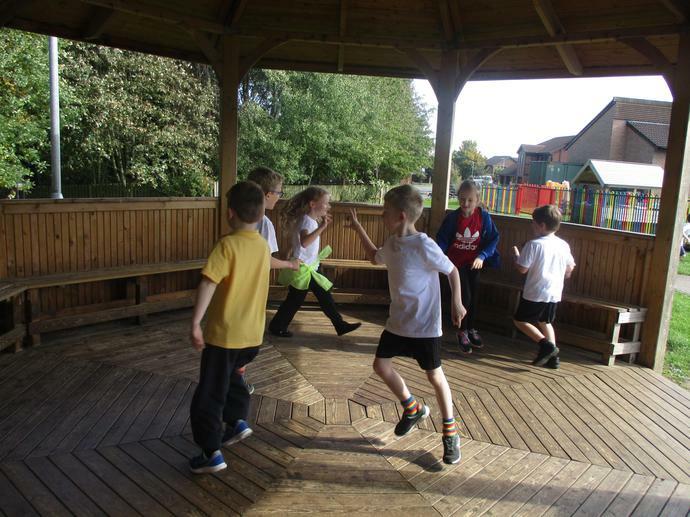 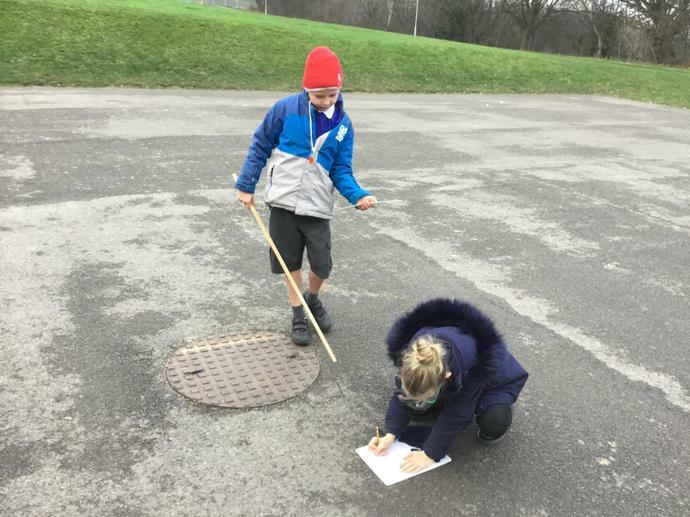 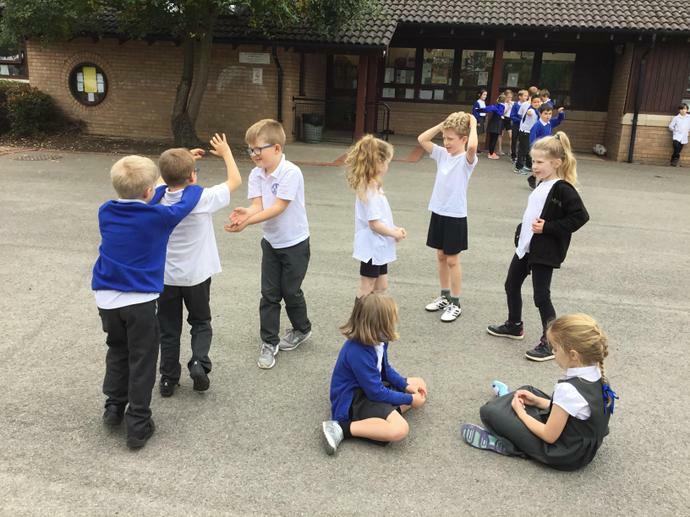 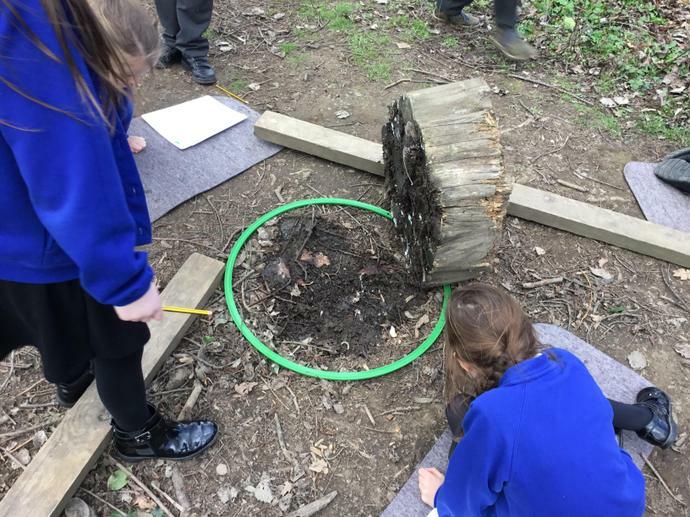 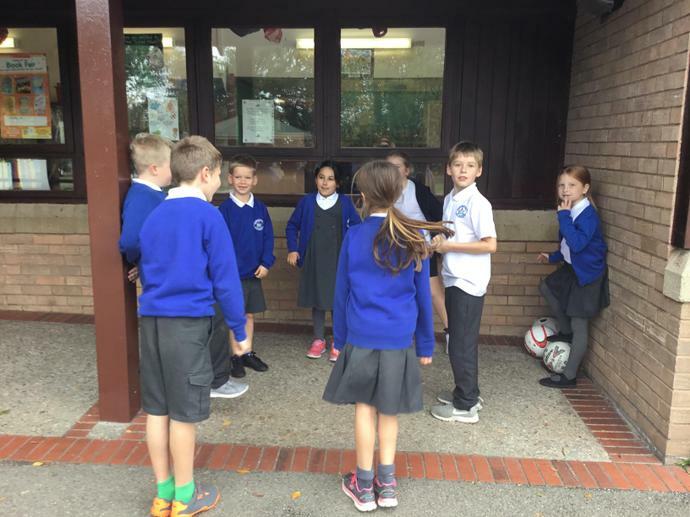 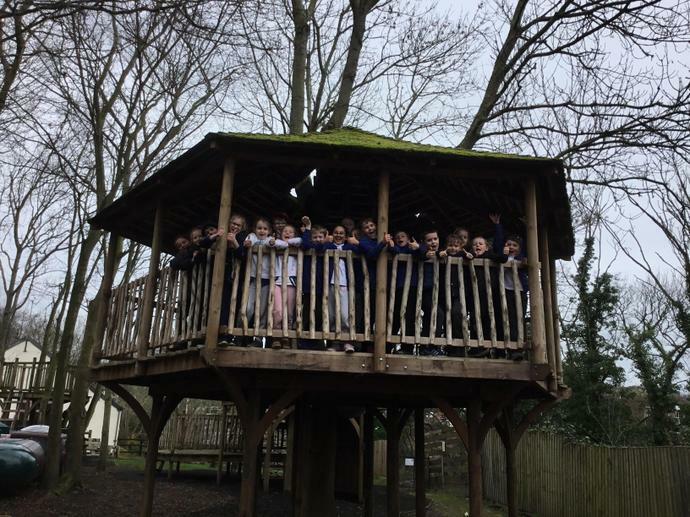 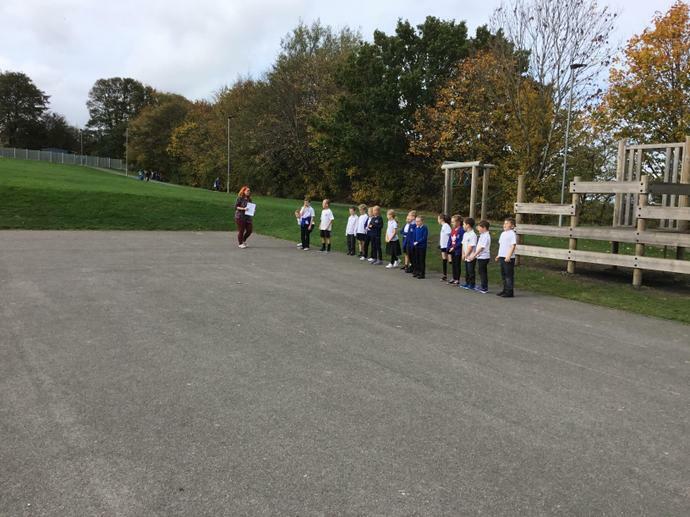 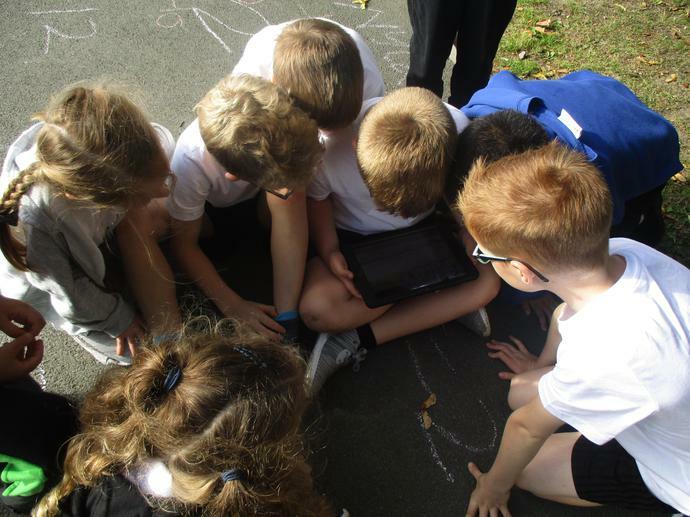 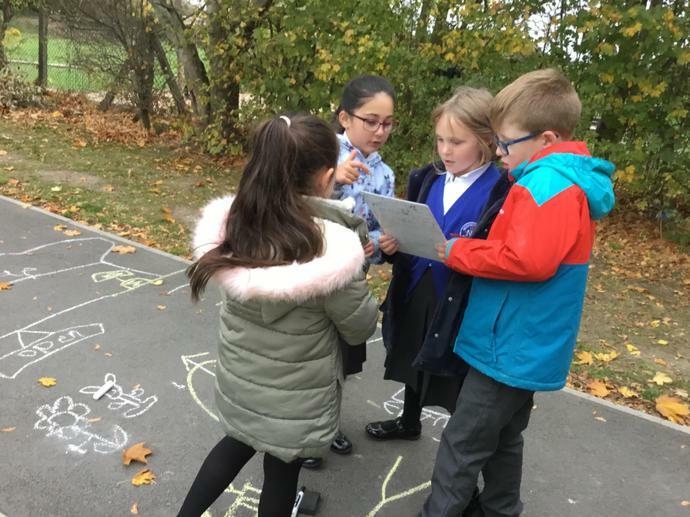 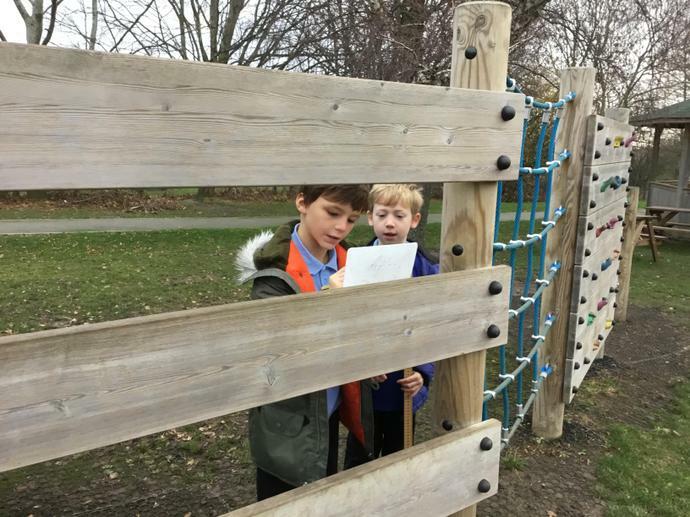 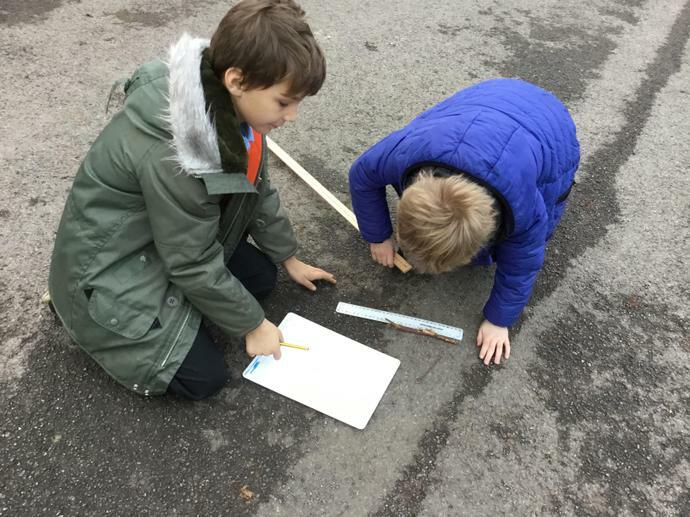 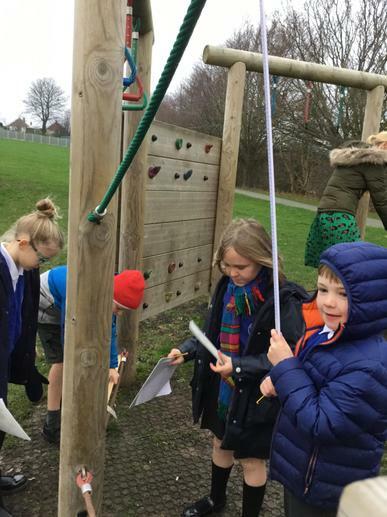 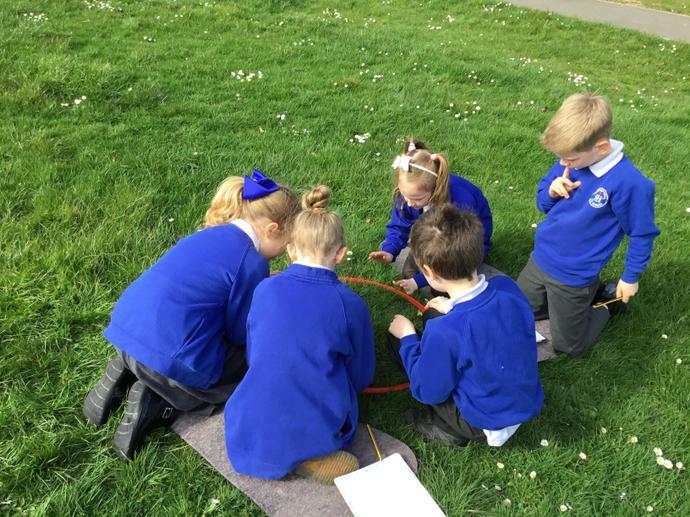 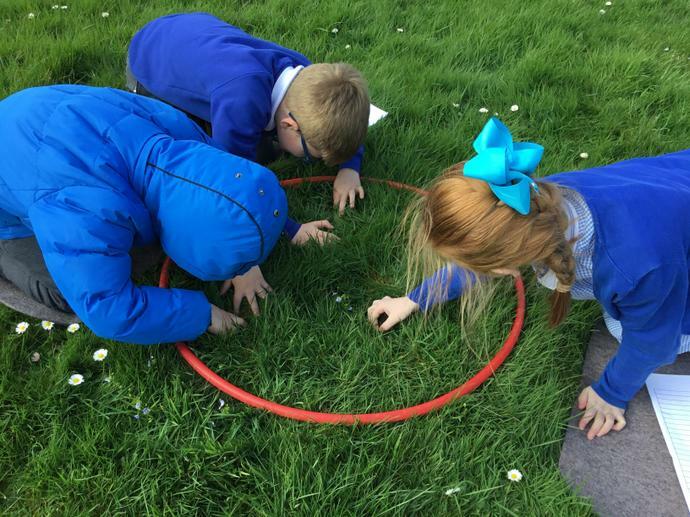 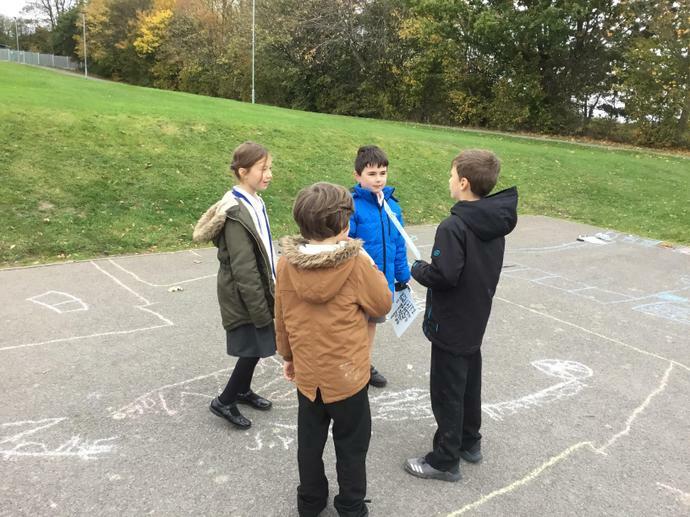 In outdoor learning this week we had different sound related activities. 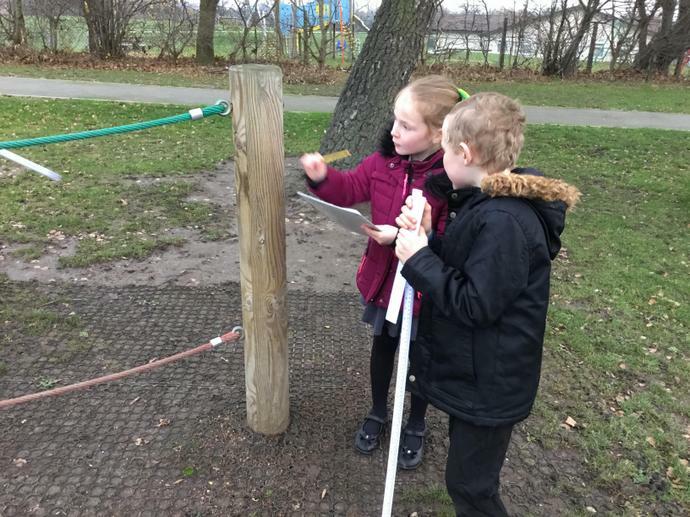 We used a data logger to find sound levels around school. 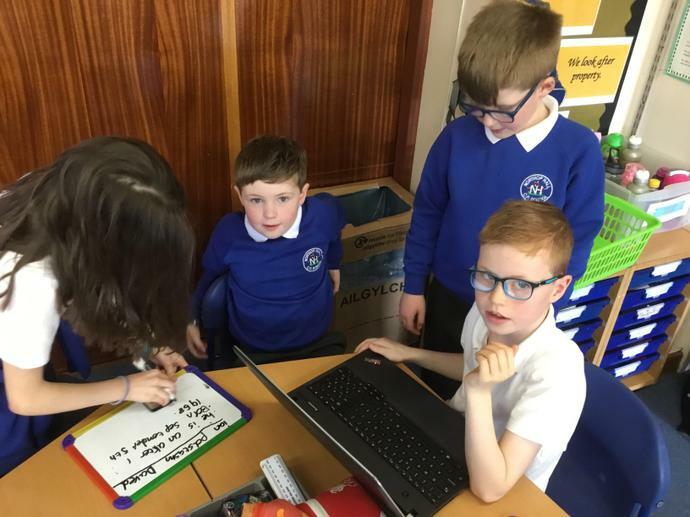 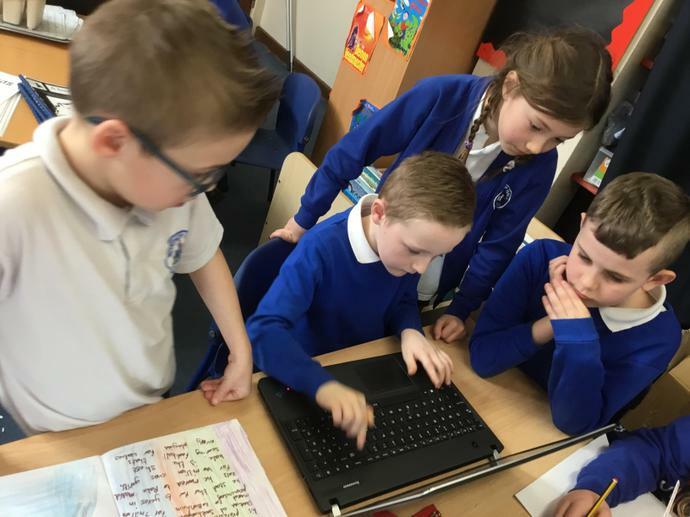 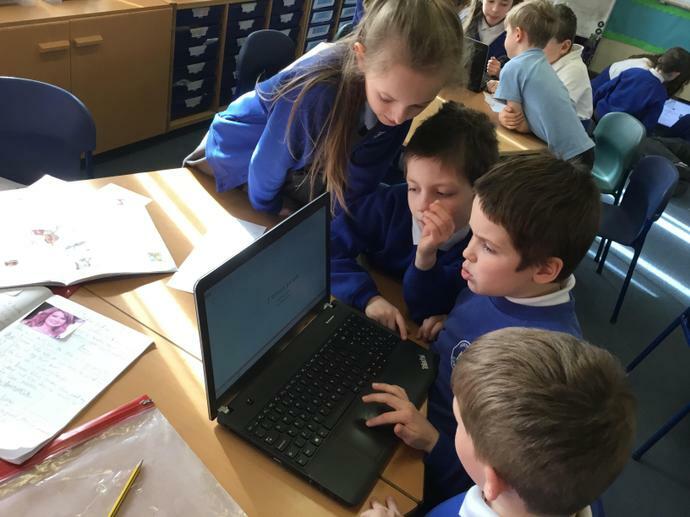 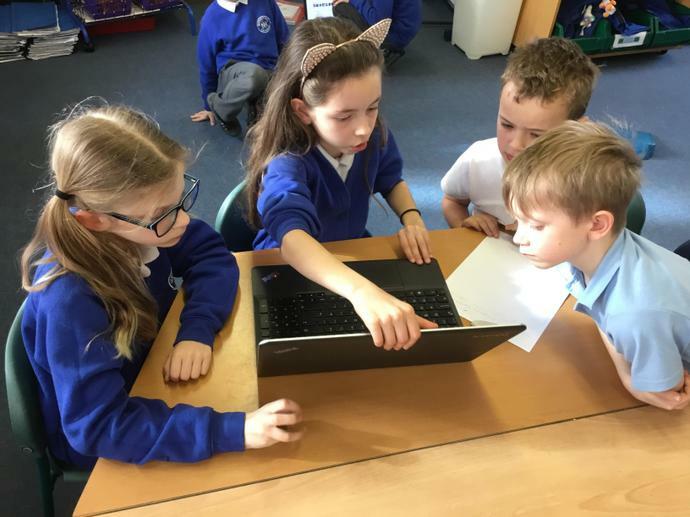 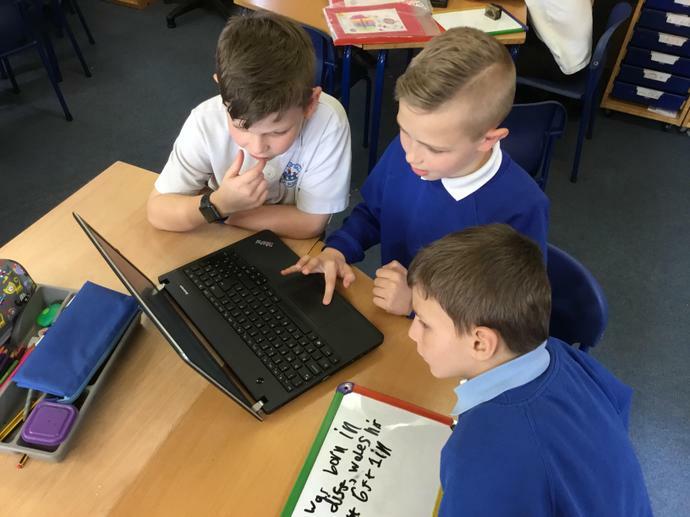 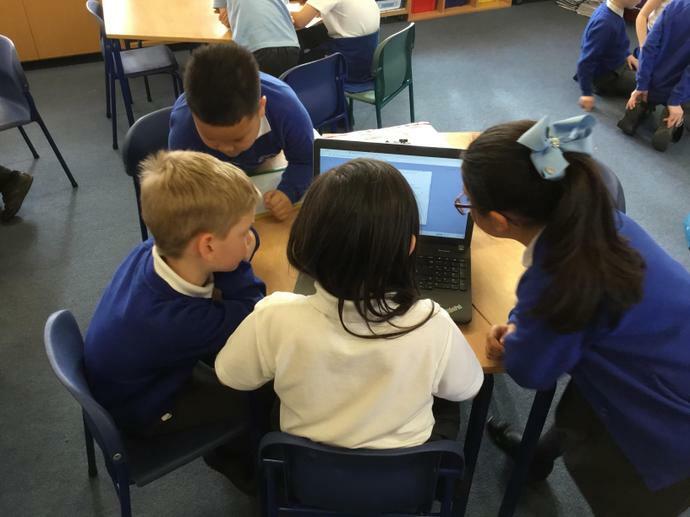 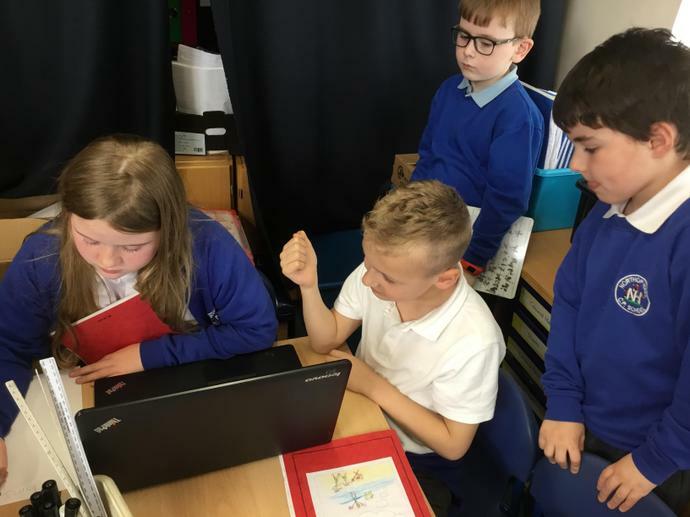 Working well with our Learning Partners to write narrative poetry. 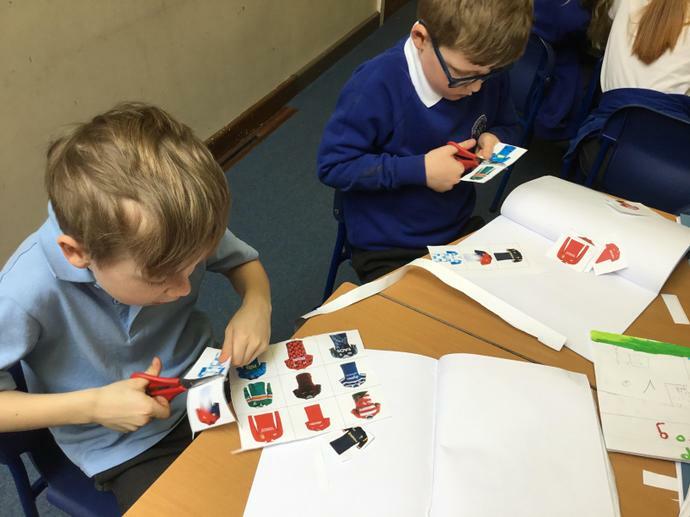 Today the children made their own toy shops to practise mental strategies. 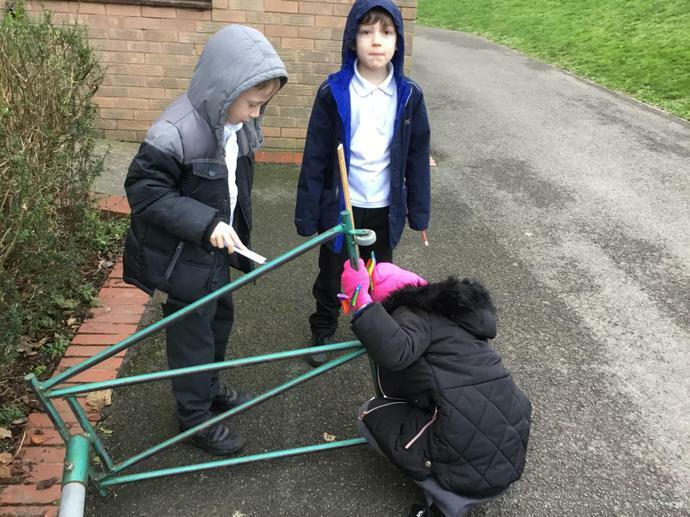 Our focus was working out change from £2. 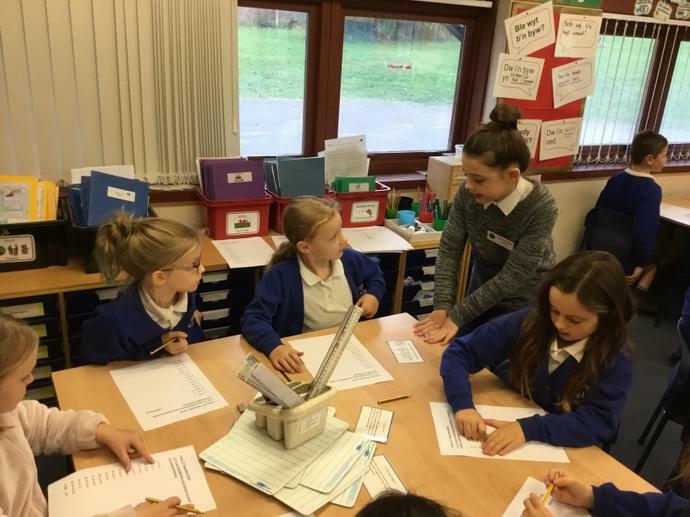 We had lots of role play buying and selling in the shops. 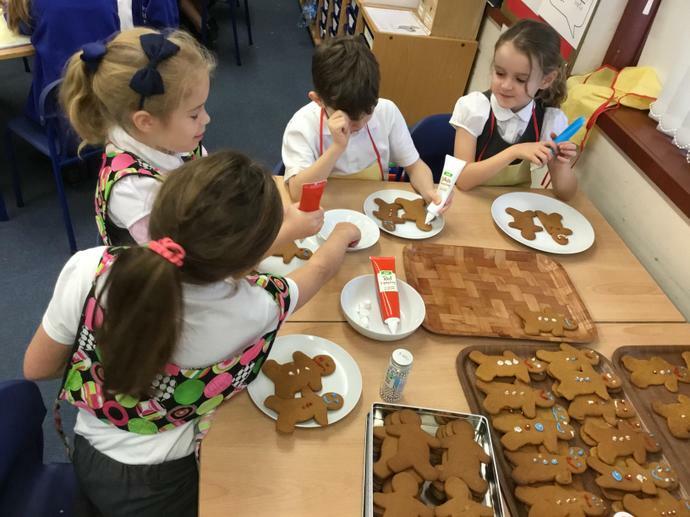 The children all worked hard but we had a few forget to pay! 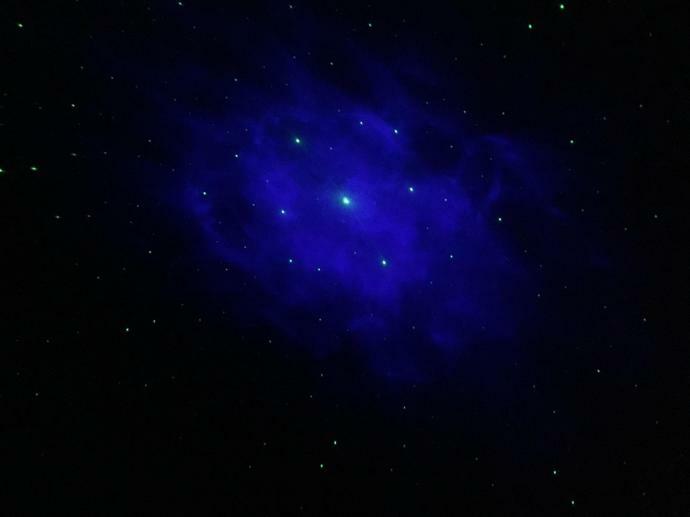 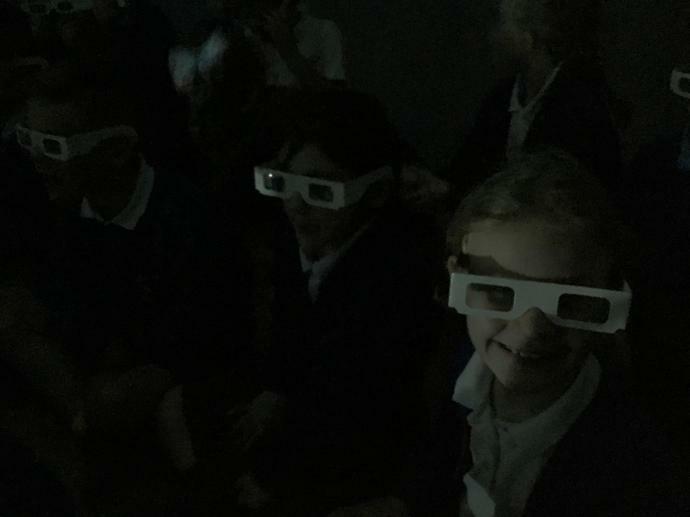 We have had a fascinating experience in the light dome this morning!  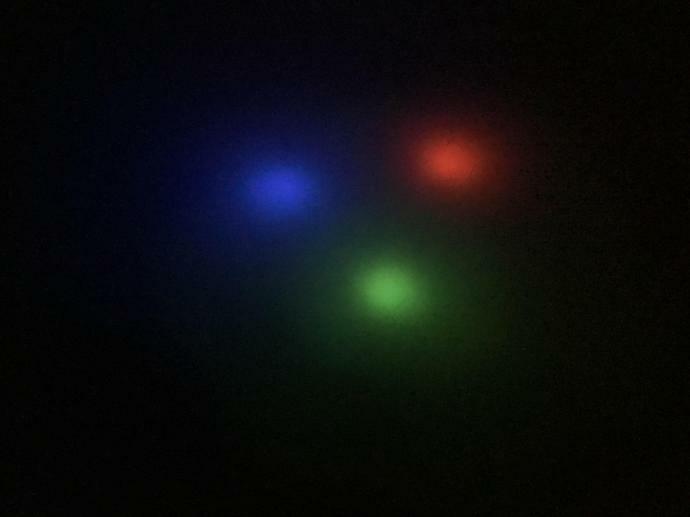   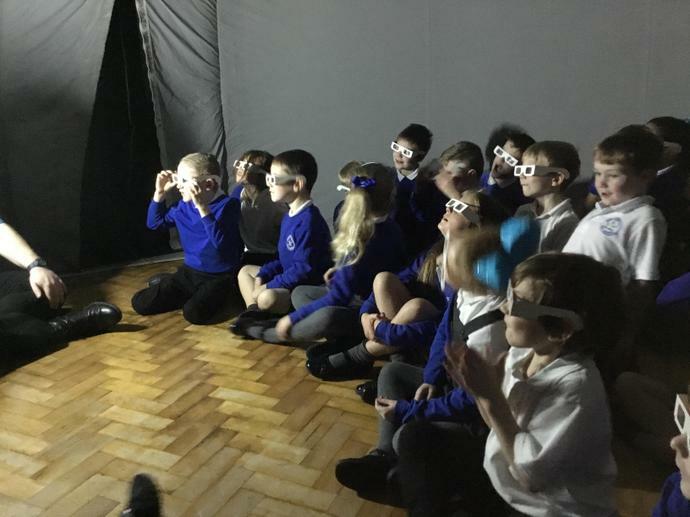 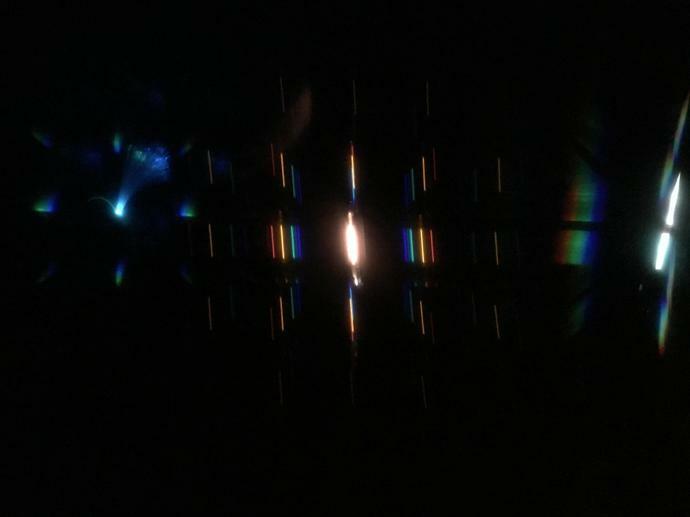 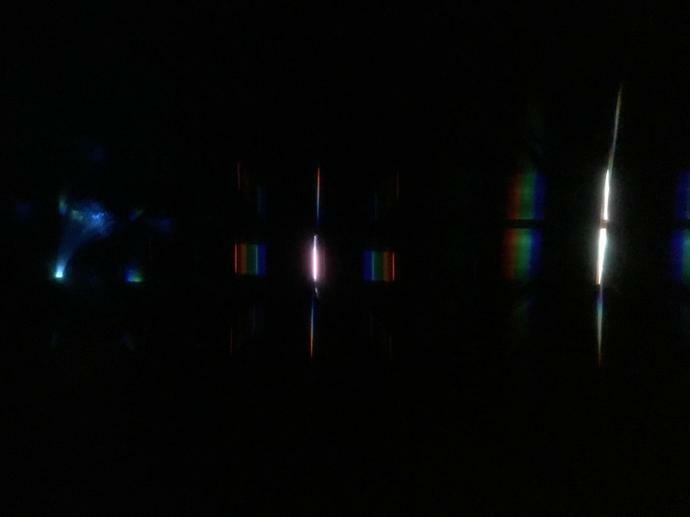  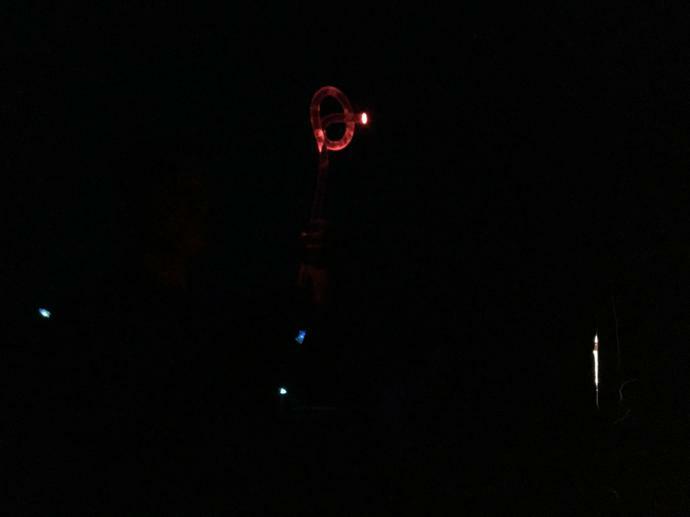 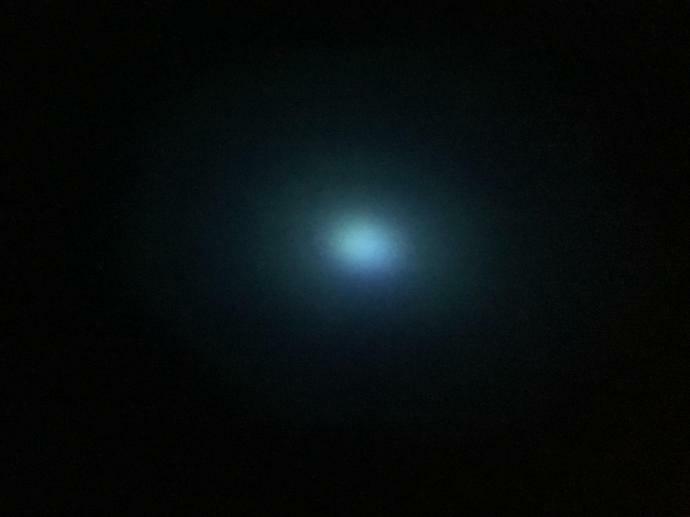 We learned about how light travels, colours of light, light sources and wore special glasses that let us see how light is split into colours by different gases. 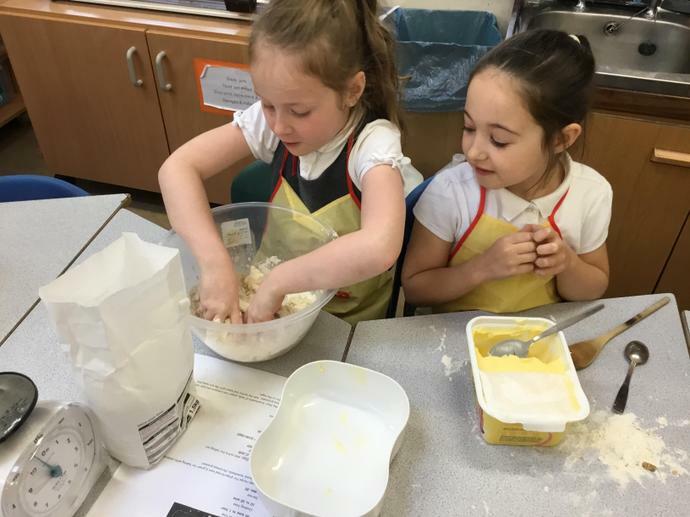 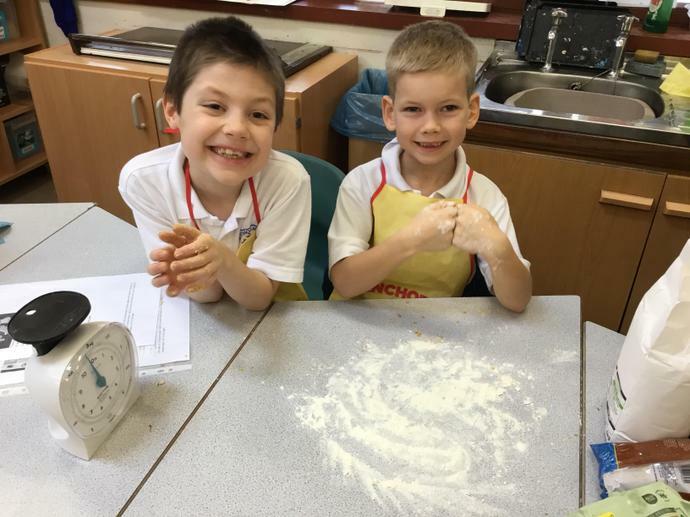 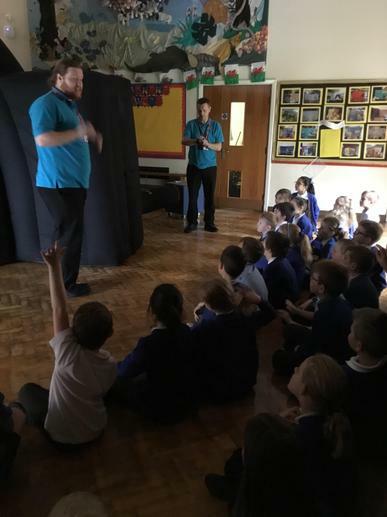 This week we have been focusing on Welsh activities. 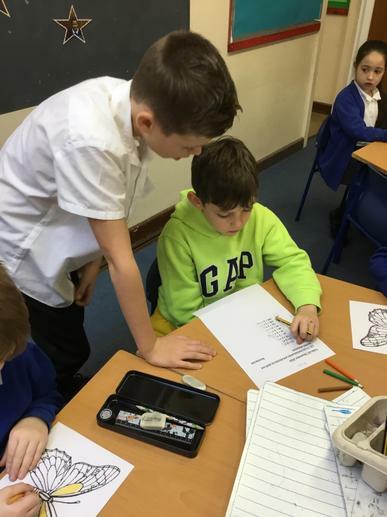 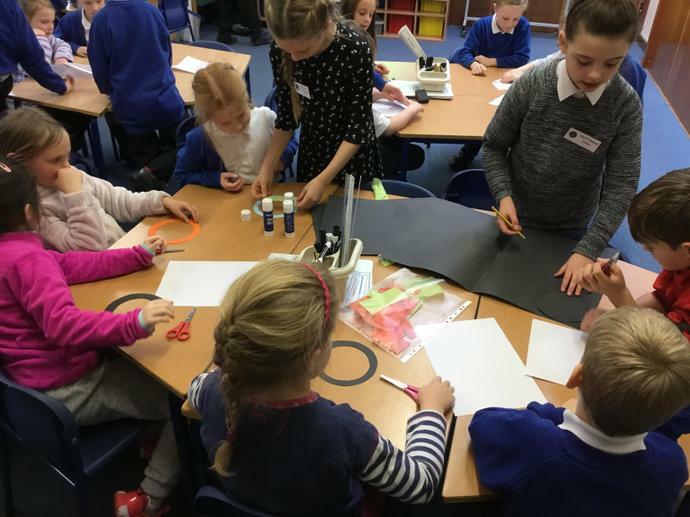 We have designed our own dragons, dramatically retold the tale of the ‘afanc’, and played games in Welsh. 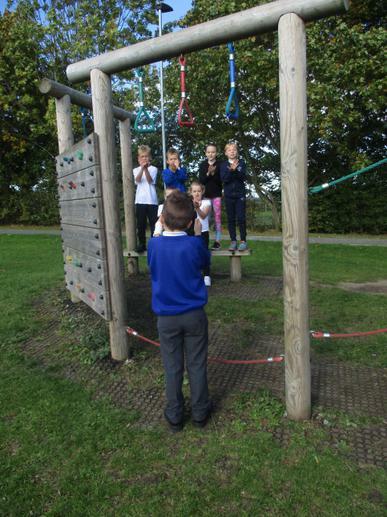 As always, we have been improving our teamwork skills with Year 4! 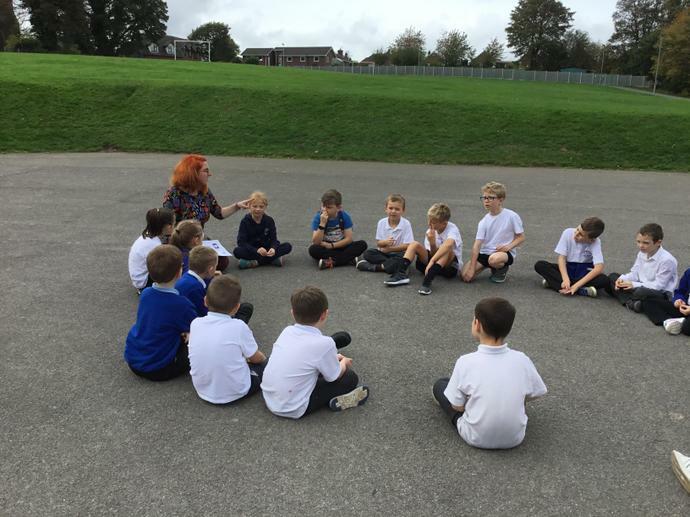 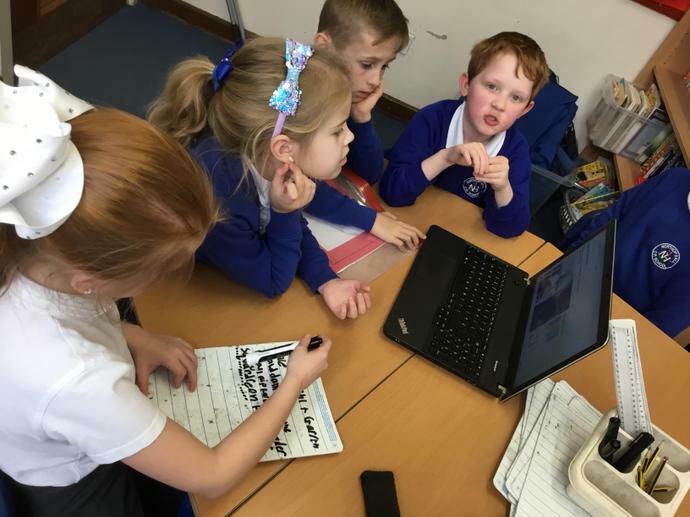 While some children are away at Pentre, the rest of Year 3 and 4 are finding out about “learning powers”. 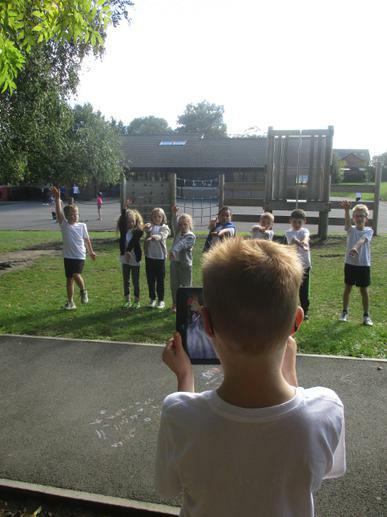 We’re planning our own movies using iMovie to explain to everyone what these are. 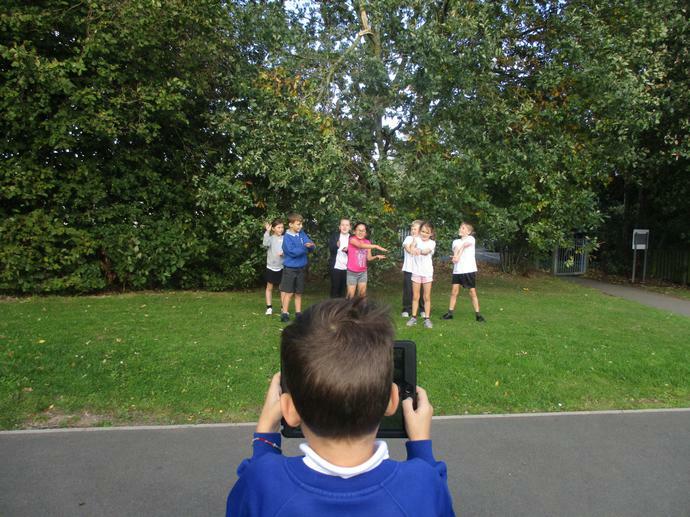 Watch out Steven Spielberg! 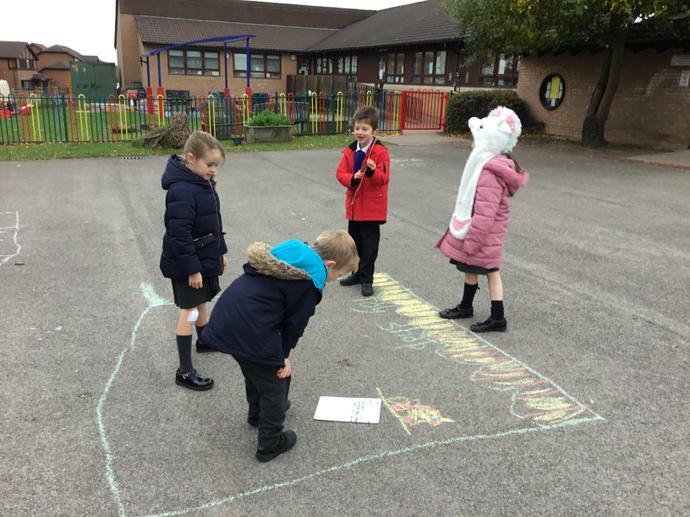 We’re starting a unit on story poems this week using ‘Where the Poppies Now Grow’ by Hilary Robinson and Martin Impey. 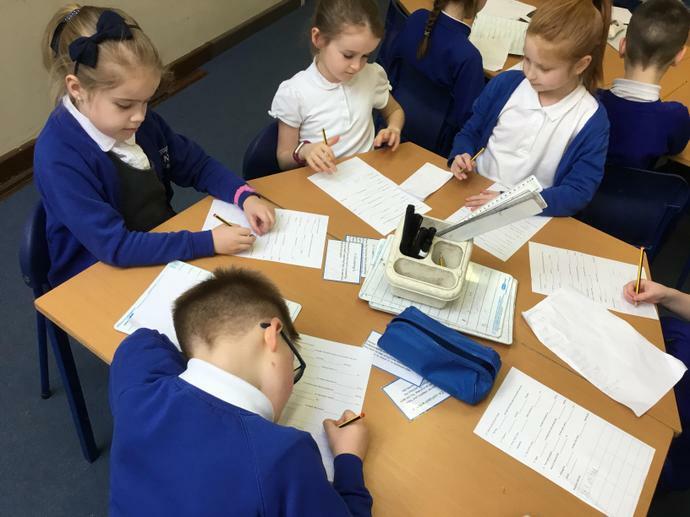 We’ve started to learn the text and are doing really well! 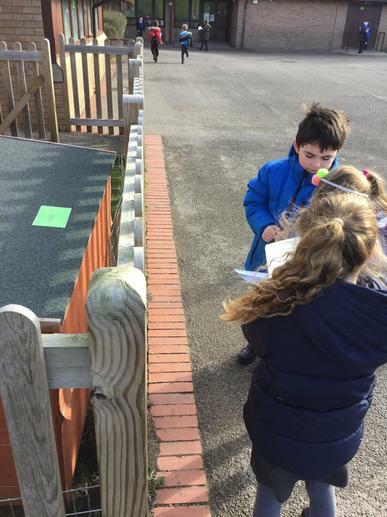 Ask your child to tell you what they’ve learned so far. 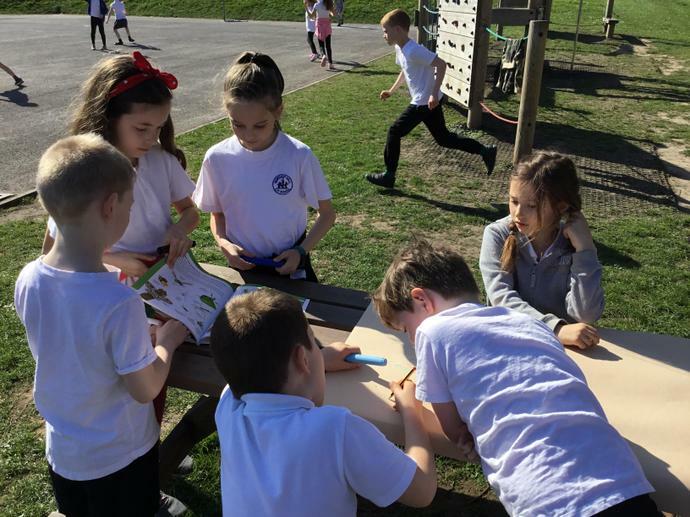 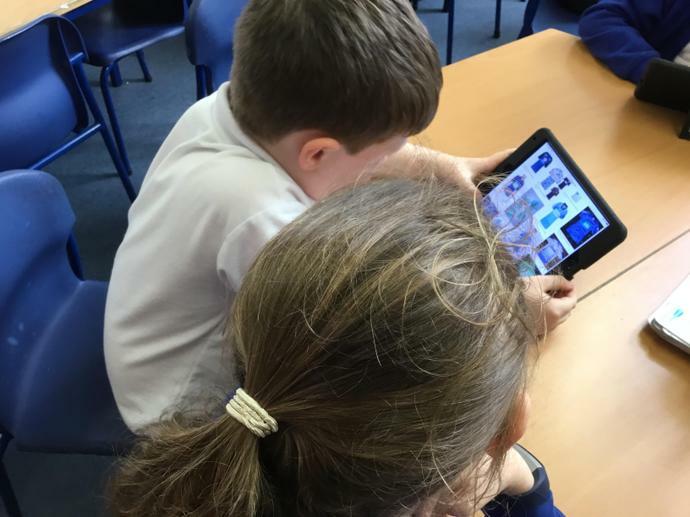 Today the children worked with their learning partner to map out the text using pictures. 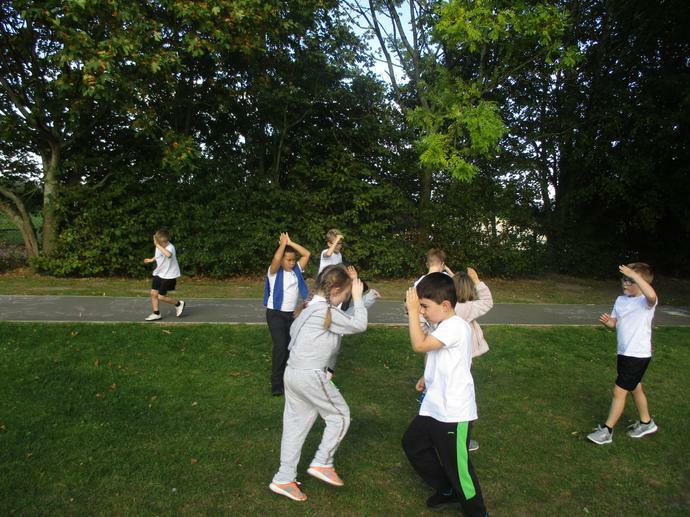 Working hard to improve movement in gymnastics. 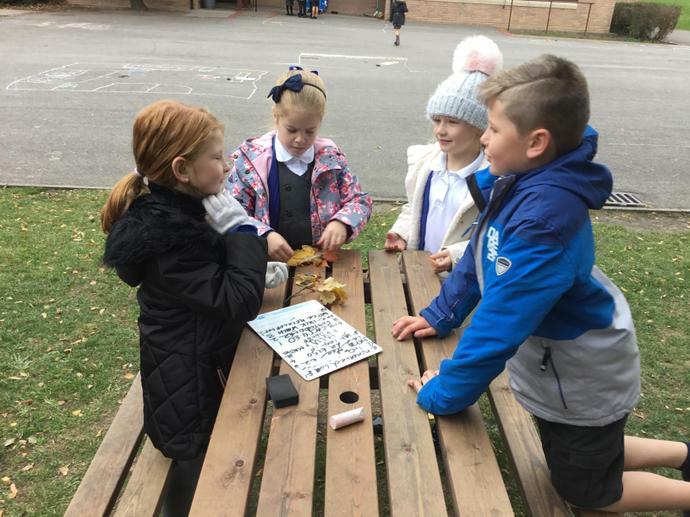 Playing games using mental addition strategies. 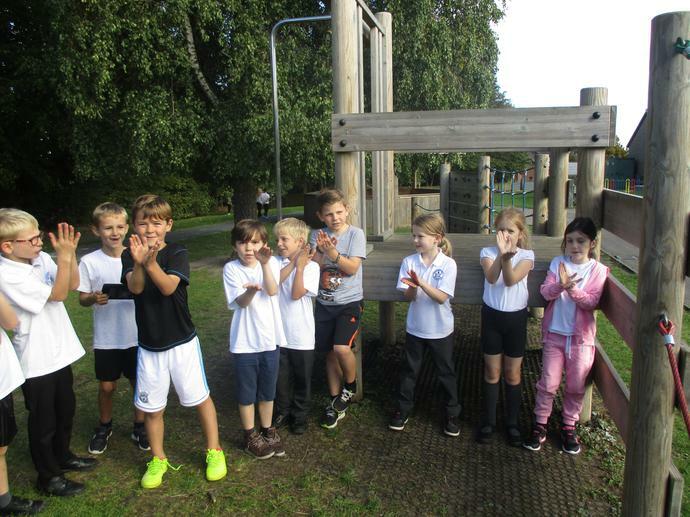 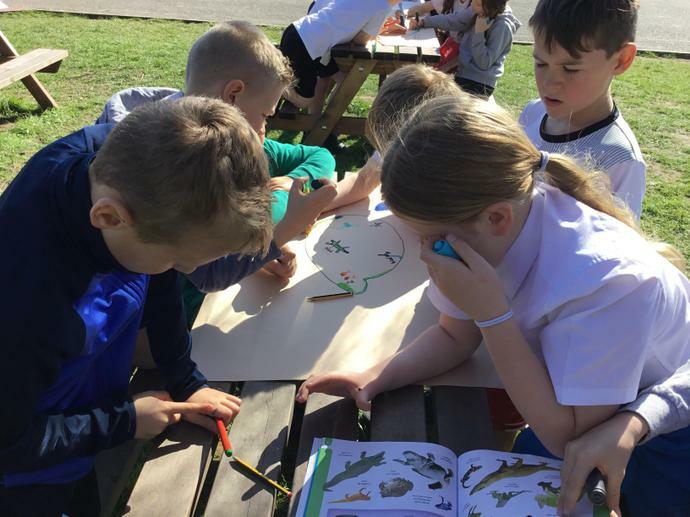 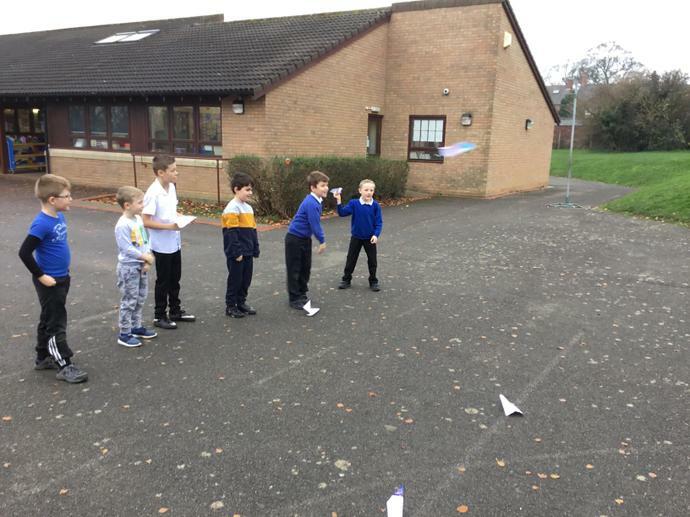 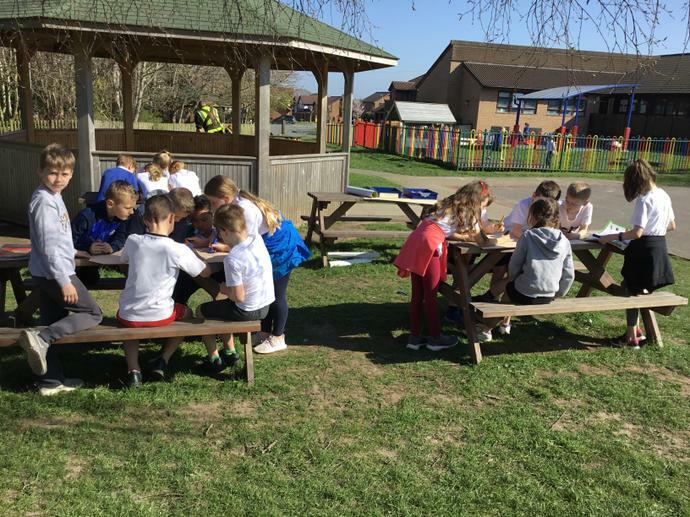 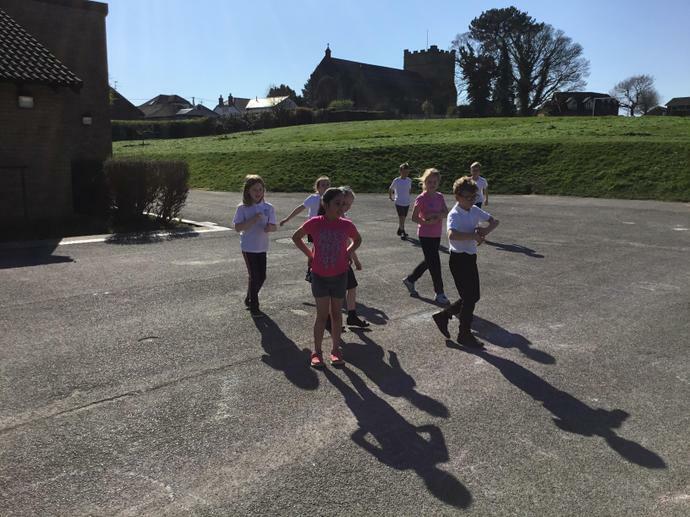 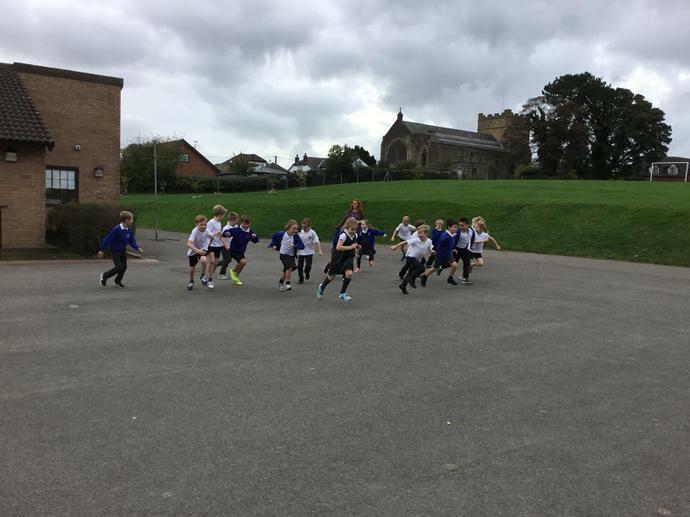 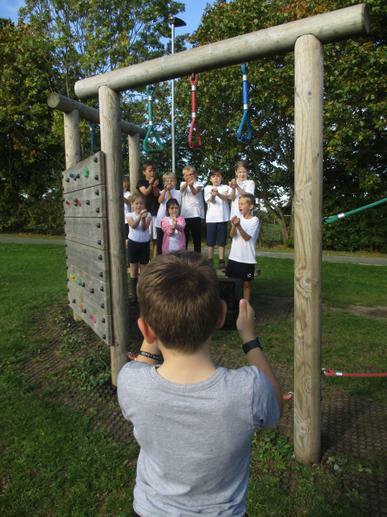 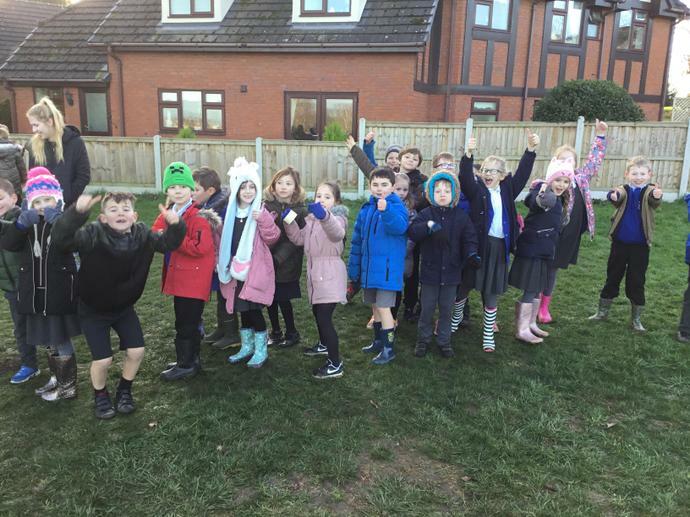 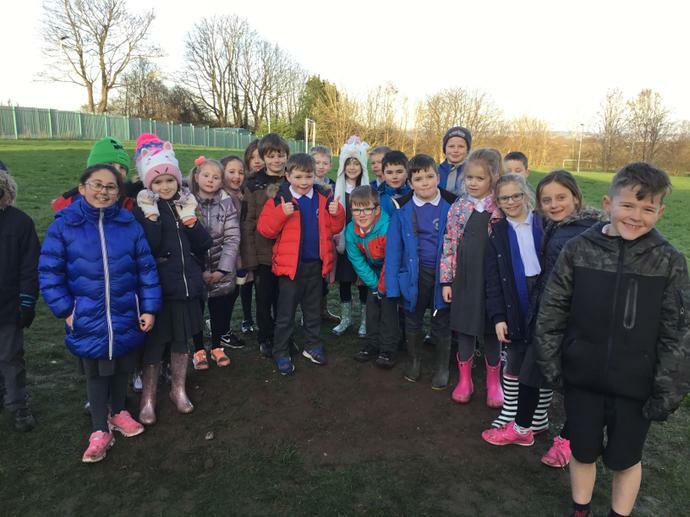 Outdoor learning with Year 4 - the Baby Shark Challenge!! 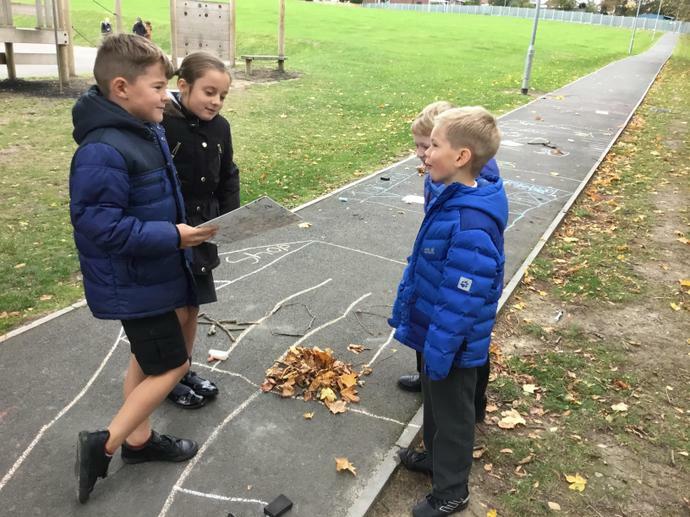 Estimating - we've been trying to estimate 100 leaves... with varying success! 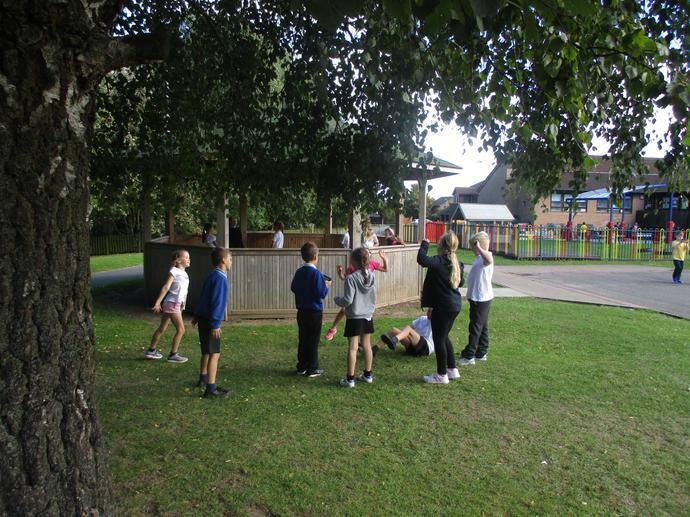 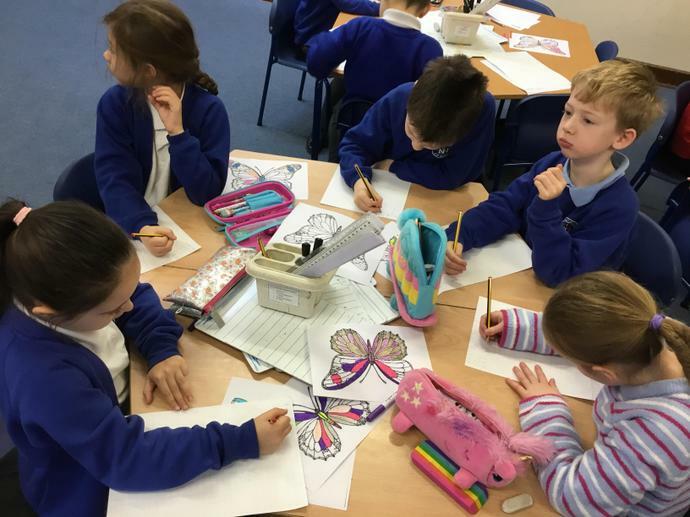 The children are starting to settle in well and have been working hard. 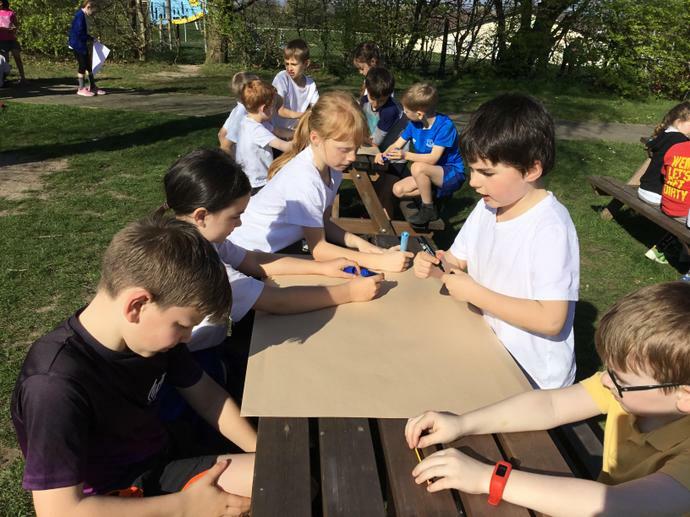 We've done some team building activities, pictures below.